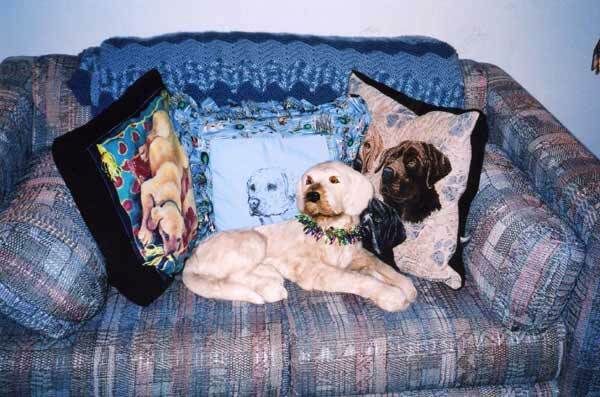 Pictures from happy customers of Furry Animal Figurines & Gifts. 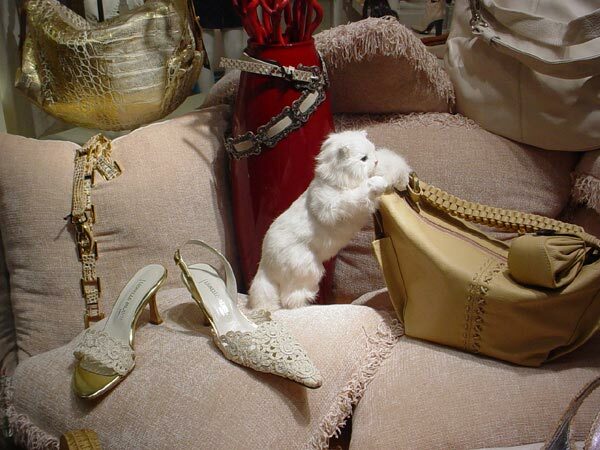 Realistic and Lifelike Furry Animal Figurines! who loves their new pet!!! 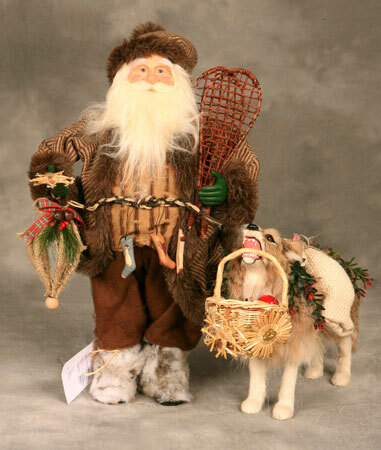 These are some of the things people have purchased our Furry Animal Gifts for. I hope people will find this page very entertaining. Do you have a picture for us to publish?? If so, please email it to be added to our "Snapshots" page! 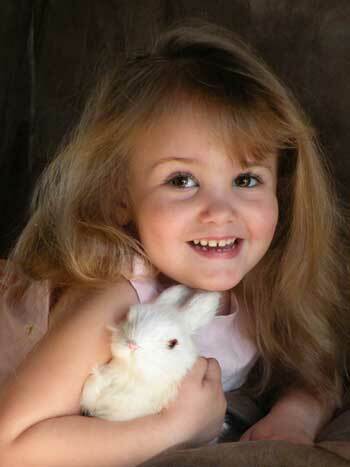 RYLEIGH & HER NEW BUNNY "SALLY"
but we couldn't find one within the store. I started surfing and found your site. 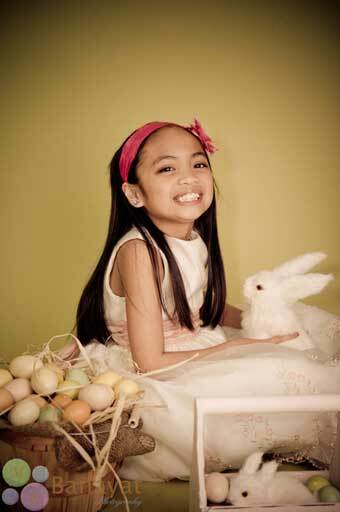 The bunny is very close to that in her sister's Easter pictures. THE BABY DUCKS ARE GREAT FOR A RAINY DAY! THE BABY DUCK LIKES PLAYING WITH LITTLE GIRLS! Hey guys!! Your favorite photographer here. It's that time again for doing Easter minis. 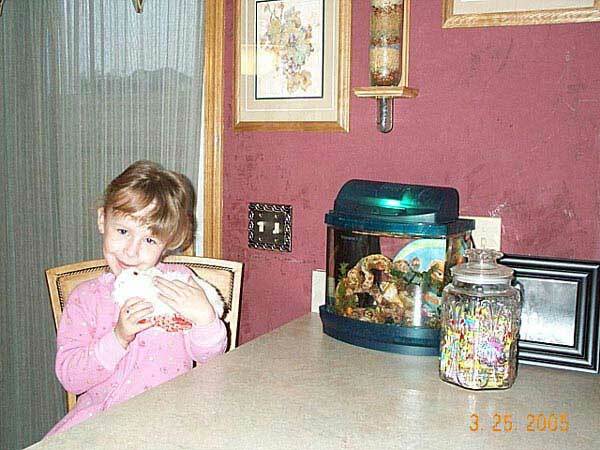 Thought I'd share the most adorable picture ever with you. 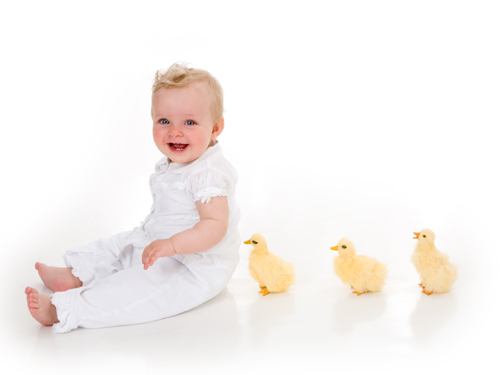 ANOTHER GREAT PHOTO FROM KARA T USING THE DUCKLINGS AND RABBITS! THE BLACK CAT MAKES A GREAT HALLOWEEN PROP! The little black kitten quickly arrived in terrific condition. We love the newest addition to our Halloween decor! Our own kitty also enjoys it's company, though we keep a close eye on him. Anyhow, I enclosed two photos to show you how perfect the kitten looks along side our wicked witch. Thank you for a great product and easy purchase! THE TURKEY MAKES A GREAT THANKSGIVING DECORATION! 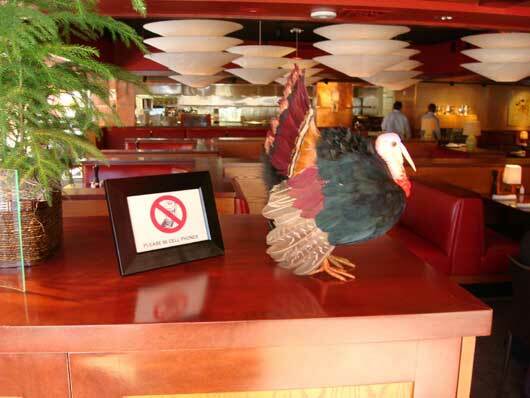 Here is a picture of the turkey at the entrance area of our Charlotte restaurant. HAPPY 99TH BIRTHDAY TO GERTRUDE! I cannot thank you enough for your wonderful web site and your products. The black (and some white) kitty and the mallard duckling arrived this afternoon and they surpassed my expectations. The web pictures are great, but seeing and touching the cat defies belief. My dog saw the black cat and immediately wanted to inspect it. I have 2 cats that he adores and constantly plays with. I guess he figured another cat had joined the family. My aunt's birthday is tomorrow and I suspect this kitty will be the highlight of her 99th birthday. I know my aunt is going to love it. 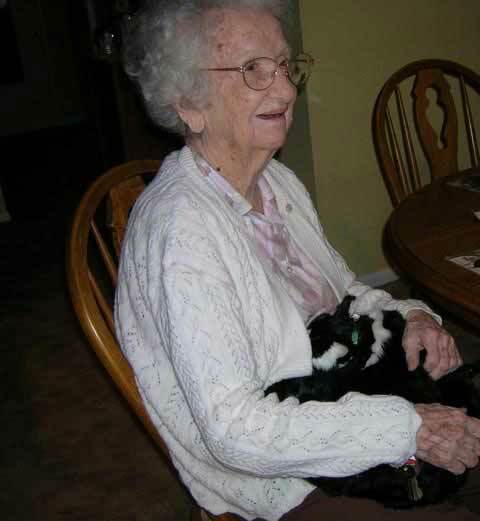 She always loved to have her own cat sit on her lap and sleep. I never had any grandmothers, as they all died before I was born and this aunt is the closest person I have to a grandmother. So you can see why I am so excited about finding your wonderful website and the fantastic animals you have gathered to sell. The mallard duckling is for my niece, who adores baby ducklings and wanted to catch one at our local park. I think this is a wiser alternative. I am astounded at how realistic it is. I cannot thank you enough for all your attention and hard work on my behalf. It is so nice to have my faith restored that there are truly caring and honest individuals who sell products via the internet. Please keep me on your mailing list forever. 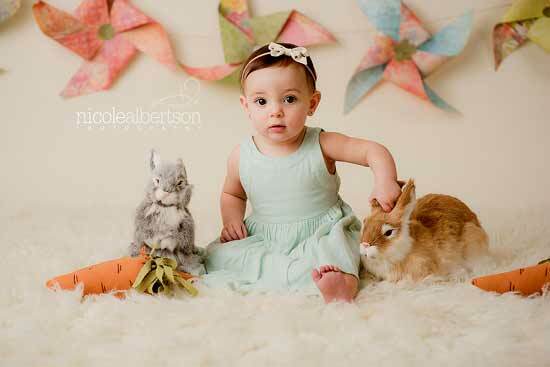 THIS REALISTIC BUNNY RABBIT MAKES A GREAT PHOTO PROP! I love my rabbit! 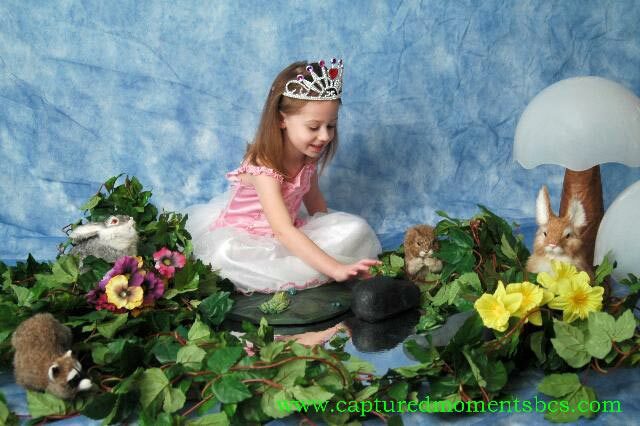 Great for pictures and the little kids think it's real. 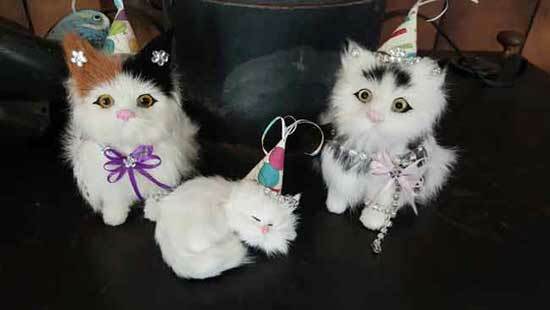 THIS REALISTIC KITTY CATS ARE DRESSED UP FOR A BIRTHDAY PARTY! Hi, Everything was fantastic. 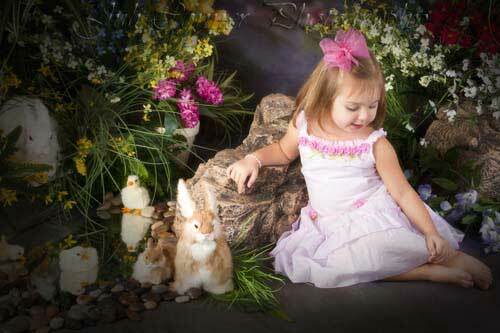 I will attach a few of the Easter photos our photography studio used the bunnies in. Thank you for everything, especially the hand written letter, it did not go un-noticed! THE AMERICAN BULL DOG WANTED TO GET IN THE PICURE TOO! 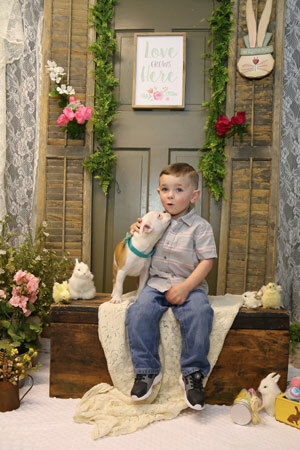 The furry babies were a hit! THANK YOUUU EVER SOOOO!!!! Thought I�d share some of the fun for you to see!!!! You In Photos By Nanc Inc. 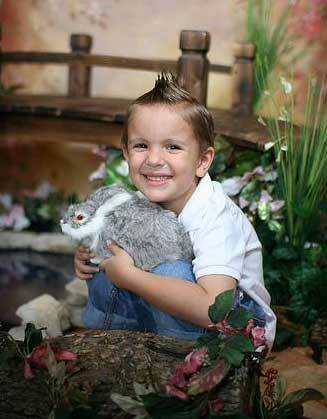 THE FURRY RABBIT MAKES A GREAT PHOTO PROP FOR EASTER PHOTOS! 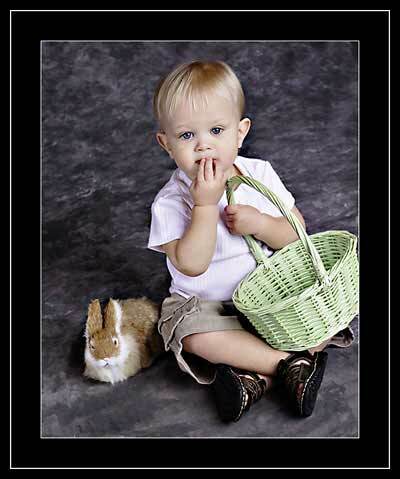 Deb, Thanks so much...the rabbit looked so realistic. 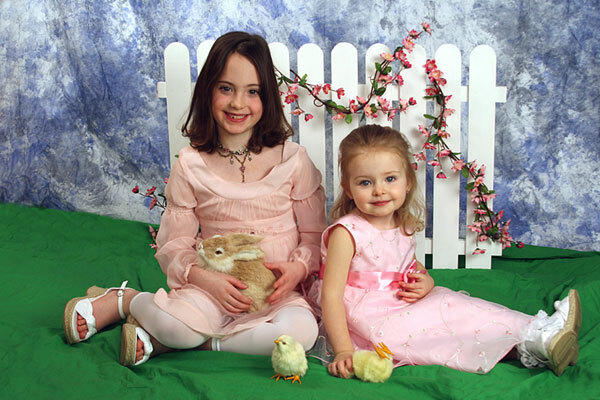 Attached are my daughter's Easter pictures. THE FURRY ANIMALS HELPED DECORATE OUR CHRISTMAS TREE BEAUTIFULLY! I am sending you photos of our Christmas Tree. 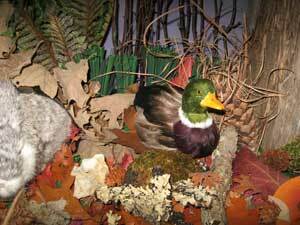 It contains many feathered birds, real plant material and feathers. We have had traditional Christmas for many years and I wanted to try something different. It took many months of looking for just the right materials and your business really put the finishing touches on my (masterpiece). 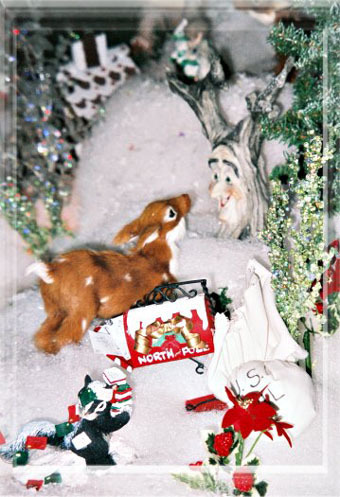 The Furry Animals are used in a scene at the base of a new Christmas tree I designed last year. 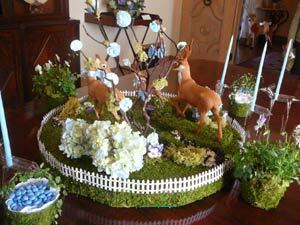 THE BABY CHICKS MAKE A BEAUTIFUL TABLE ARRANGEMENT! 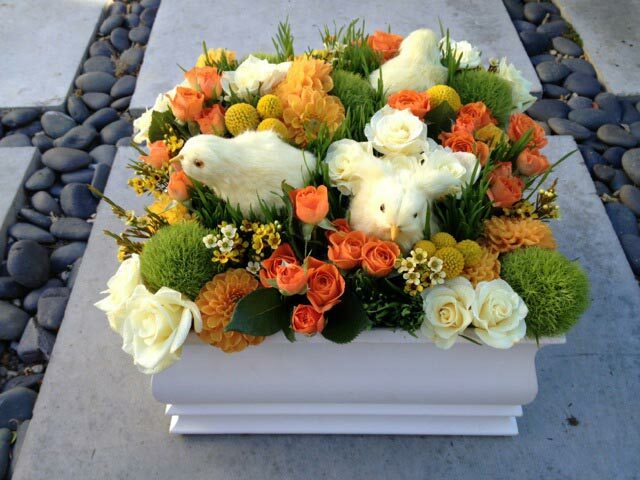 Here is a photo of the arrangement I did with the chicks in it - they loved it! Thanks and hope to be able to incorporate other wildlife treasures in the future! 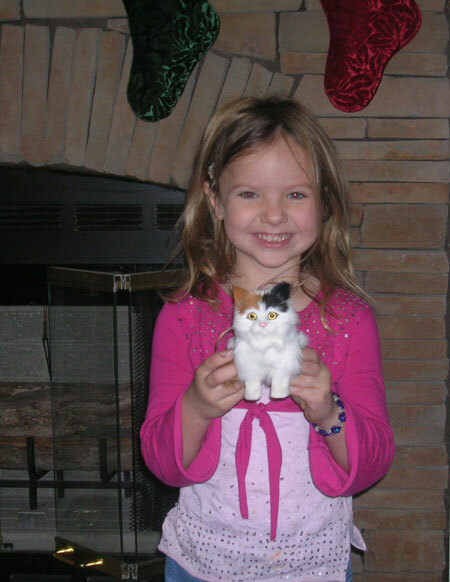 PUZZLE THE SOFT PLUSH CAT WAS DAD'S FAVORITE BIRTHDAY GIFT! I received the kitty the day before my trip to Sweden and it wound up being my dad's favorite 90th birthday present. 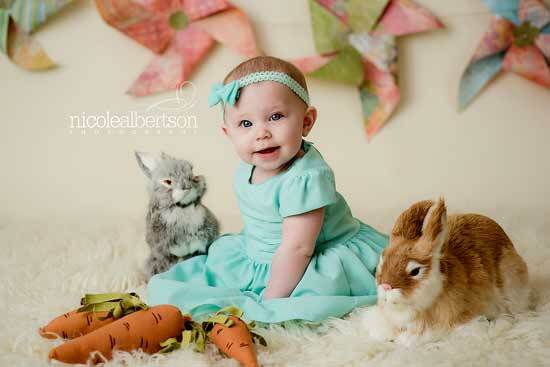 THE REALISTIC RABBITS MAKE GREAT PHOTO PROPS FOR EASTER! Here are some photos from my studio in Chicago. 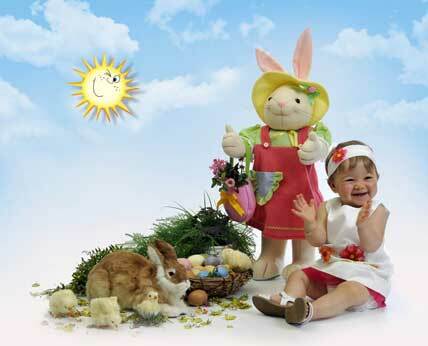 We love the bunnies, it's a big hit, the kids enjoyed them, I got real smiles from the kids. I will order some more next time, great customer service as well. 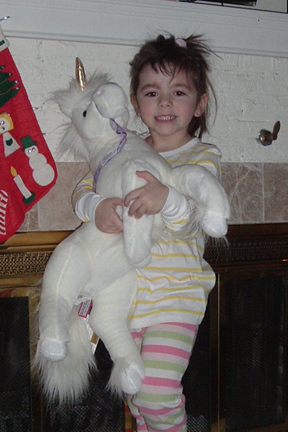 MIYA GETS A STUFFED UNICORN FROM SANTA! Thank you so very much as you can see Miya was very happy about Santa's gift. Thank you for your effort in ensuring that we had a Merry Christmas. 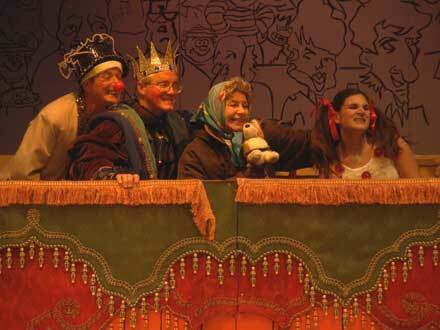 THE MOOSEHEAD WORKS AT THE PRODUCTION OF "ALMOST MAINE"! 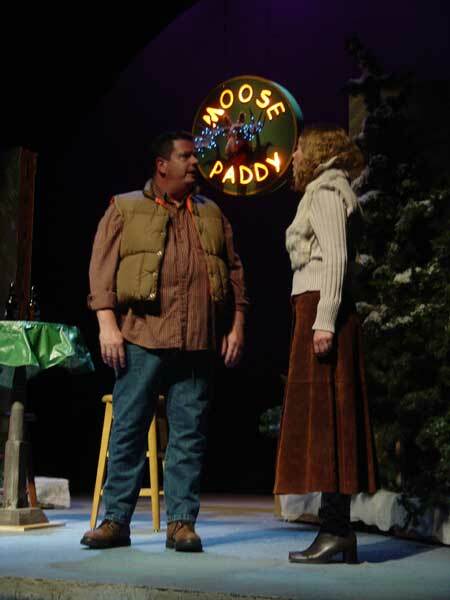 Yes, we received the Moosehead and used it in a production of "Almost Maine" a very cute play much along the lines of Lake Woebegone and Northern Exposure. I'll see if I can find a picture to send you. 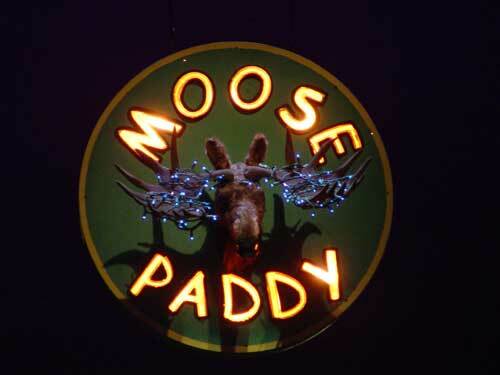 THE MOOSE PADDY BAR IN "ALMOST MAINE"
This is a picture of the Moosehead which we incorporated into a sign for the Moose Paddy Bar. their deer antlers during the holidays. 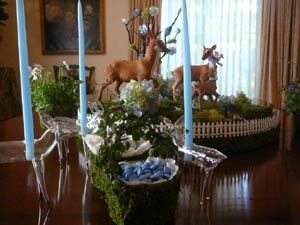 centerpiece of a baby boy shower! They are precious--thanks and happy holidays! Thank you for the personal service and super fast shipping. 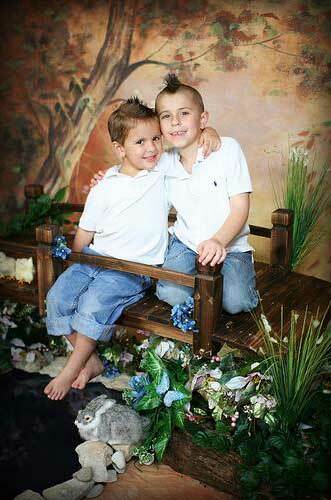 They are adorable and just perfect for our Spring pictures. I wanted to share a few. Thank you again! Just wanted to let you know that Alex did win Miss Southwest Florida. 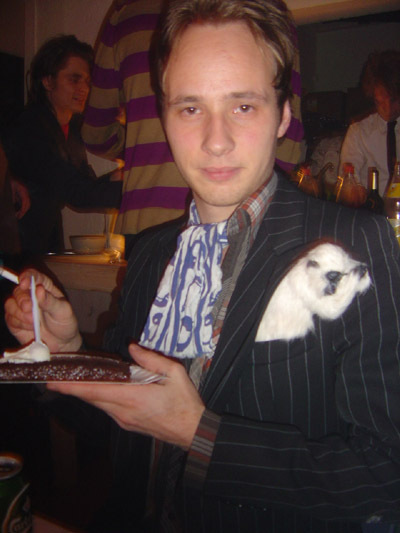 I have enclosed a picture of "Bruiser" and his outfit I made him. Alex now has to get permission beforeDear Deb, Guess who made it to New York today? I picked them up on my way home from work! I've been adoring them ever since. I even posted a few of these pics to Facebook, and friends and family thought I had gotten a REAL puppy & kitty! 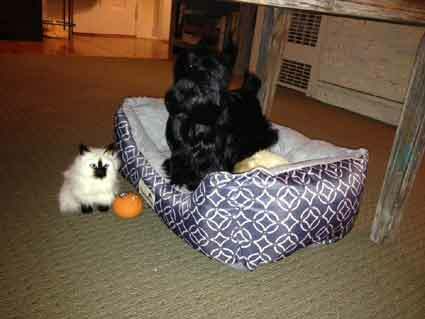 Oh Deb, I'm very happy with this Black Scottie, and the gorgeous Siamese kitty! Thank You so very much for helping me from the moment I placed the order to when they arrived. Here's some pics I took this evening! Enjoying my new Pets, La she can release her picture to a business. I'll check with her, but in the meantime feel free to use our "Bruiser". Here is a picture of Alex performing her monologue from Legally Blonde 2 in the Miss Southwest Florida Miss America Pageant 2011. 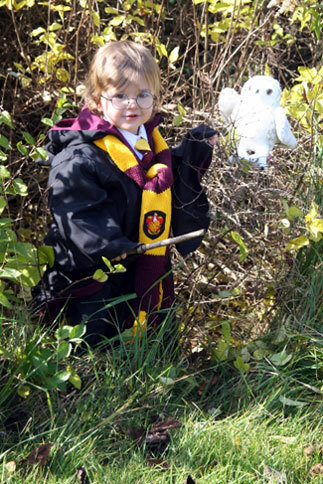 LIL' PHANTOM THE PLUSH SNOWY WHITE OWL MAKES A PERFECT HARRY POTTER COSTUME! 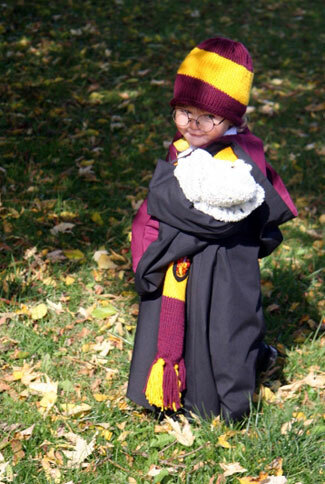 The owl was to finish out the Harry Potter Costume. But he loved it so much, we didn't put it away after halloween! I can't believe how silky it is ! The owl was a hit! Here are a couple images to show you! My son's name is Clayton. 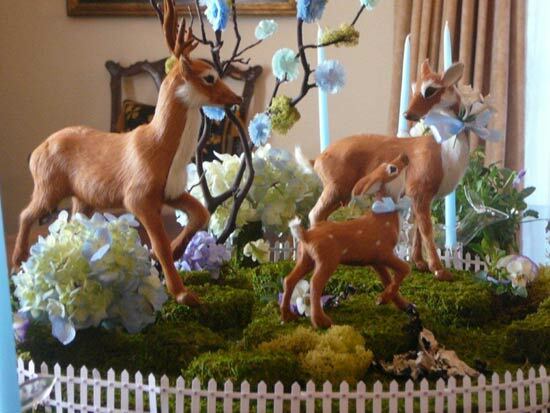 Here are some wonderful creations by Paula Hottman of Indianapolis, IN. 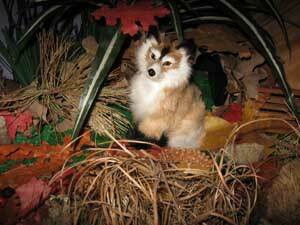 She uses our Realistic Furry Animals in her beautiful sculptures. 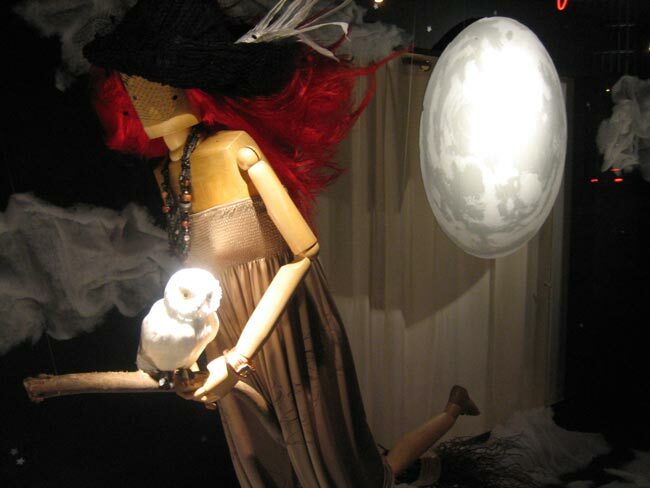 Check out the following pictures from Paula and see her creations come alive! 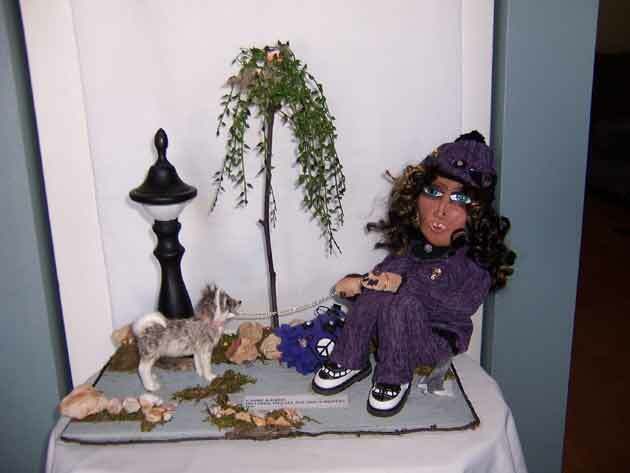 My Sculptures are handcrafted with many hours of thought, love and creativity. grace your home for many years to come and the true meaning of my art will come across to you. 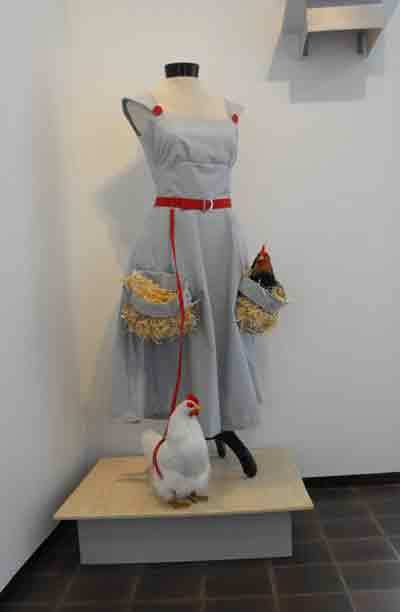 As promised here are a few early shots of my Chicken Dress which incorporates the chickens you sent me. Cannot thank you enough for your help in selecting them, as you can see - they are perfect! More to come, I'm working with a group of high school students at the Worcester Art Museum over the weekend and plan to shoot more pictures of this piece. 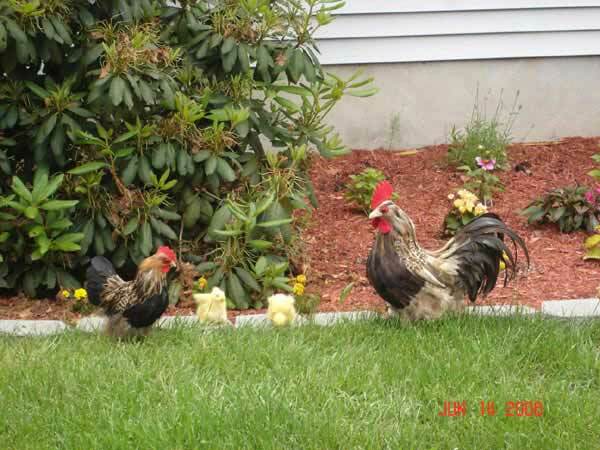 I just had to share a picture I have took with your baby chicks. I LOVE them!!! THE ROOSTER WINS A BLUE RIBBON AT THE FAIR! 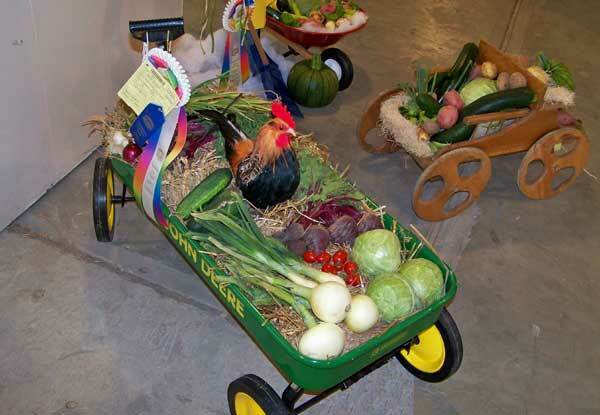 Here is a photo of last year's Fremont County Fair and Rodeo 2009, Riverton, Wyoming Grand Champion and Blue Ribbon Vegetable Wagon Contest winner. Fun to have the crowing rooster...but it made some of the people whom had to spend 2 or 3 hours doing security angry. So they were always ripping the batteries out of it...so it worked and worked well, lollollol. I remembered you wanted a photo of it as I was starting to place this years order. 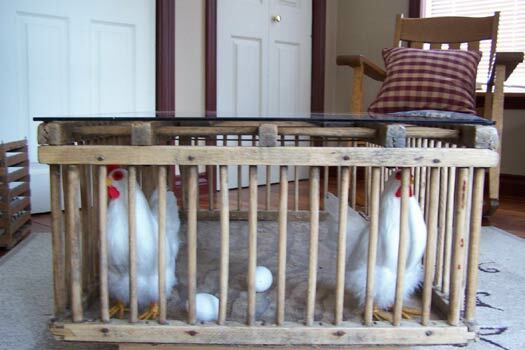 CHECK OUT THIS BEAUTIFUL CHICKEN COFFEE TABLE! 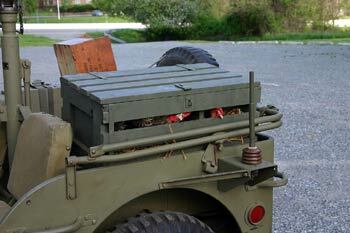 antique chicken crate that my husband restored. Yes, indeed - he arrived safely and very quickly and is now appearing on stage at the Bromley Little Theatre in my home town as the Queen's corgi in "Old King Cole" - what dizzy heights he has climbed. Actually, he has got a bit above himself and is now demanding his own dressing room! has finally released some promotional photos of him playing live at the Bromley Little Theatre which I attach here. Please feel free to use them in any publicity of your own. 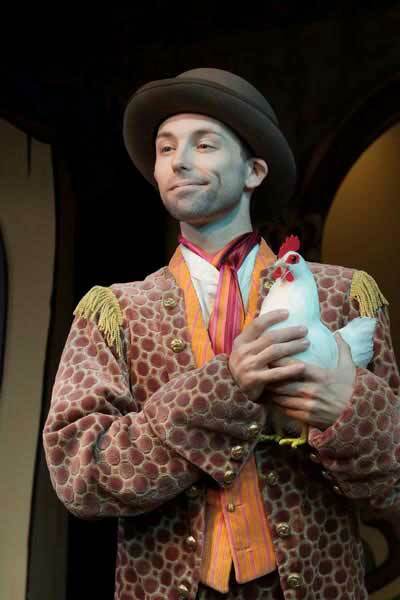 THE CHICKENS MAKE GREAT THEATRE PROPS FOR "HEIDI"
Thank you so much! The chickens arrived on Friday and are perfect. I found a cage at a local thrift store, picked up some straw and eggs so we are set. I will send you pictures next week. "WILL'S QUILL OR, HOW A GOOSE SAVED SHAKESPEARE"
Glad you like the pictures. 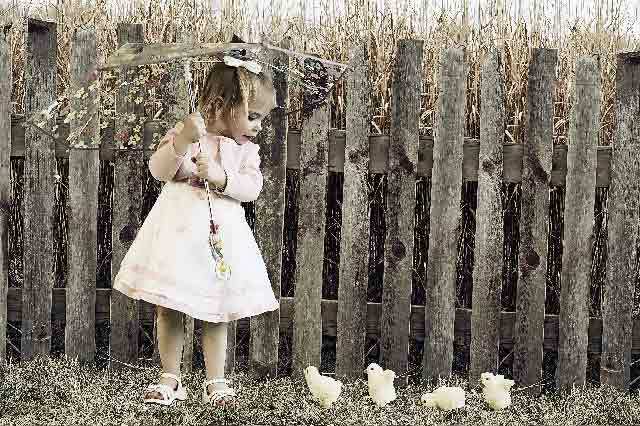 We just love those chickens! We will put them to work again in the near future. They were adorable. Thank you! I will order more when I get more order for these dolls. I have attached pictures for you! 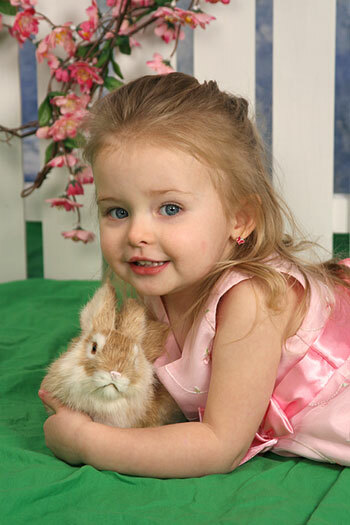 pictures of my almost three year old niece, Shea with one of the bunnies. 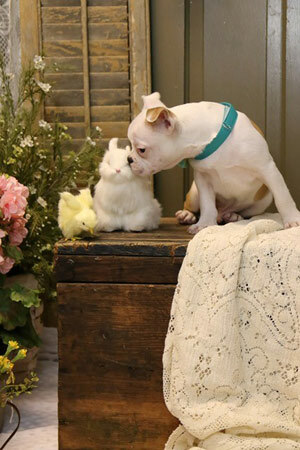 pictures of Shea with the white bunny! 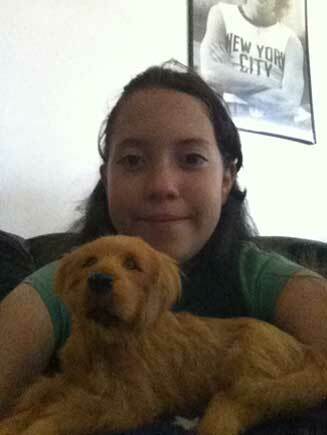 Here are pictures of my daughter and her new dog, Shadow. She sleeps with him, she adores him and she thought something you guys should add is a collar to some of them. We probably will get another for my nephew and thank you very much. Yes, I know, it might seem a bit unusual, but we have a Bernese Mountain Dog as a pet and I gave one of the two dogs I received to a friend for the birth of his baby (I couldn't for the life of me find a Bernese cuddly toy here in Ireland). The other one I gave to one of my 3 daughters. I should have known there would be unrest as the other 2 want one now as well, including me. So, to re-establish peace in the house I really need 3 more so everybody gets one. I hope you have 3 more in stock, my sanity depends on it, haha. MAKE GREAT GIFTS FOR THE WHOLE FAMILY! A year late, but not a dollar short, here are our Christmas pictures from last year. heading out to the ranch to see if he could find one. (the light of each other's life) -Walter. 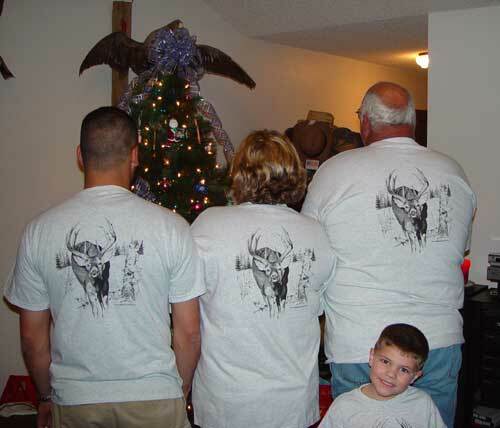 These shirts were just so wonderful and made our family Christmas extra special. 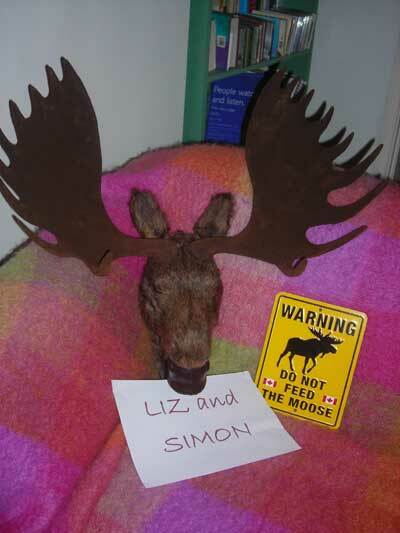 THE MOOSEHEAD WENT ALL THE WAY TO ENGLAND FOR A WEDDING GIFT! 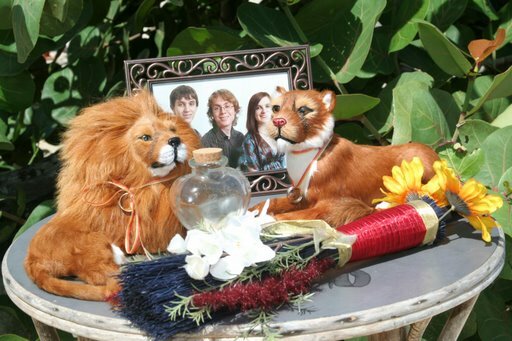 the best wedding present they received! They've called it Rocky, and it's now hanging in pride of place in their sitting room. I thought you'd like to see a photo of it just after they unwrapped it. Thanks again for all your help - this might start a trend in England! 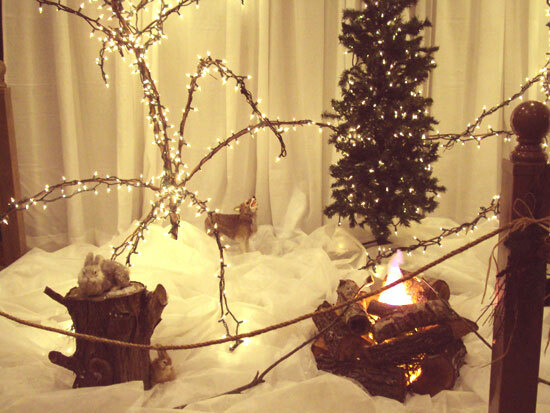 Here are pics of our winter campfire scene on display at the Columbus, GA Convention & Trade Center. 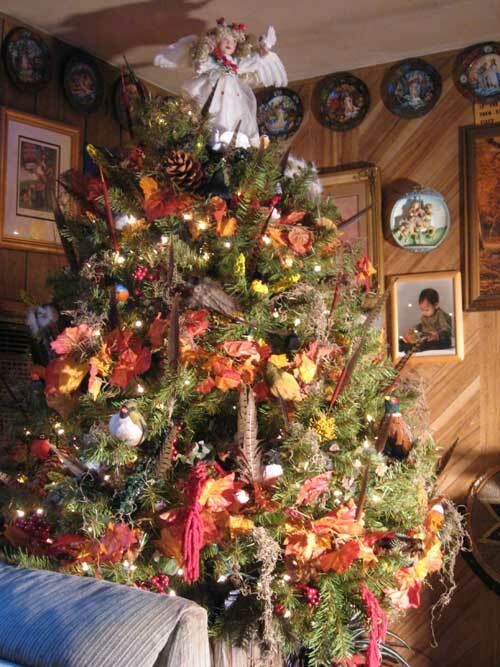 We decorate early because this weekend is our annual "Christmas Made in the South" arts and crafts show, one of our largest events. Thanks for our new additions - the fox and the coyote. Merry Christmas! 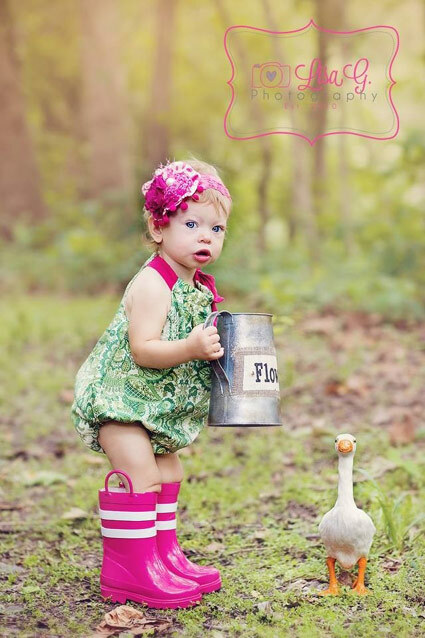 THE LITTLE GOOSE TURNED OUT TO BE A GREAT PHOTO PROP! SPRING BRINGS LOTS OF SHOWERS! 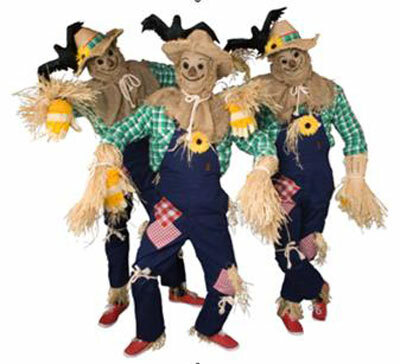 THE FLYING CROWS LOOK GREAT ON THE SCARECROWS! This is the second order of crows that we have ordered from you, the first was back in 2010 (I think). 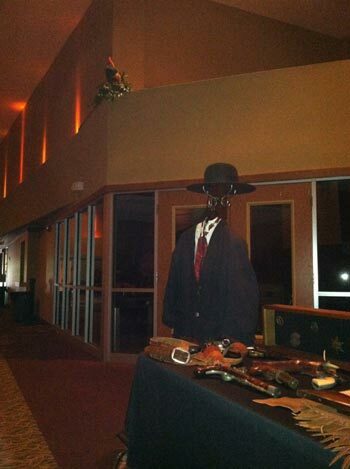 Our company owns a roving character business providing themed characters for corporate events and in this case we have used the crows to adorn the hats of our "Scarecrow" characters. Thank you for the beautiful roosters. My boss was very pleased with them. Here are some pictures from our event. This was our biannual dinner for Senior Adults at our church, Central Assembly in Springfield, Missouri. 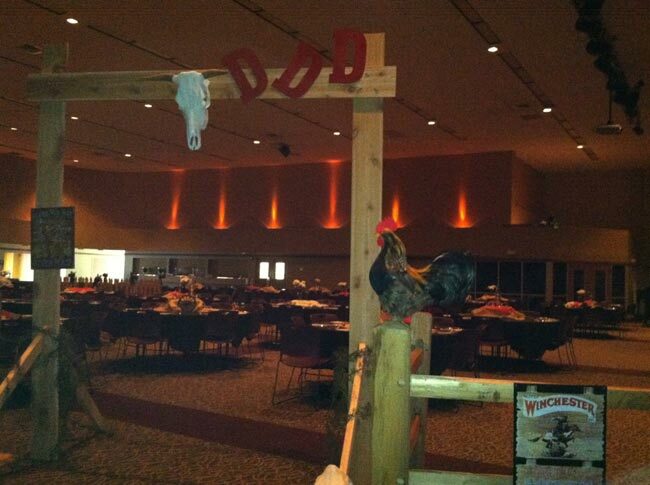 We had around 200 at this event and the theme was "Down at the Triple D Dude Ranch". We had steak, chicken, corn on the cob, baked beans, cole slaw, potato salad and desserts and drinks. We had stick horse races and watched clips from old westerns. It was a great evening and we thank you for your part!!! It was great to have such personal customer service! 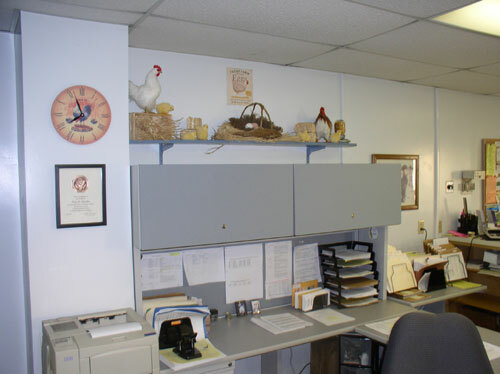 I'm not sure you will remember me, but I ordered some chickens for my husband, John (including the talking rooster) for my husband's company who's motto was "Focus on the Plan; Don't chase chickens". I then ordered another talking rooster from you in December, which was sent to the president of the company (Peter, in the picture) who lives in Sweden. 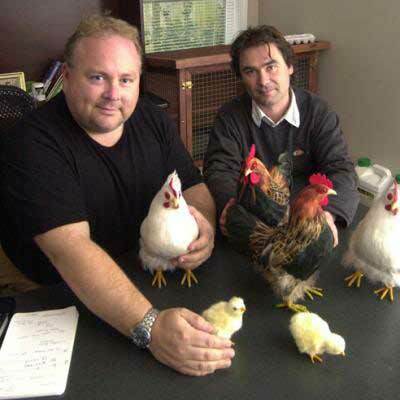 Thought you would enjoy seeing your birds in the local business journal!! The coop that the chickens reside in can be seen in the rear of the photo! Thanks so much! 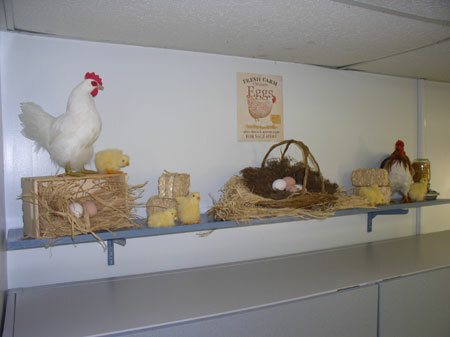 Who would have thought your chickens would be such a hit with everyone who visits John's office!! Everyone just LOVES them! 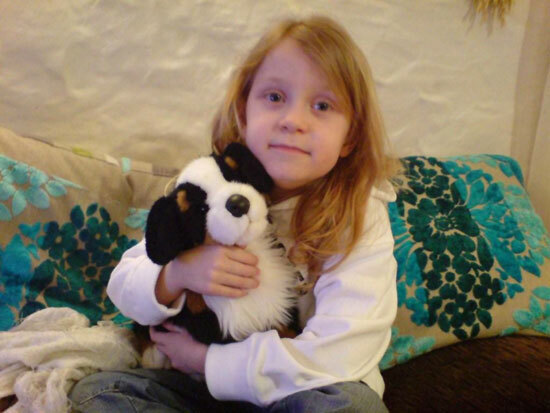 LITTLE GIRL VERY HAPPY FROM ENGLAND! special treat for her. Thanks for shipping it so quickly. She really loves it! 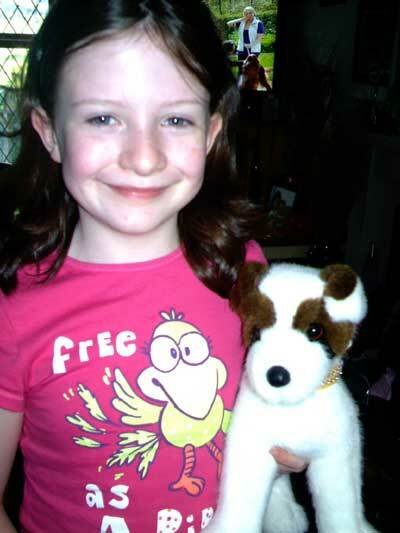 Kayla called her Jack Russell Buster as her auntie has a dog with that name and Kayla loves him so much, she called yours after him. 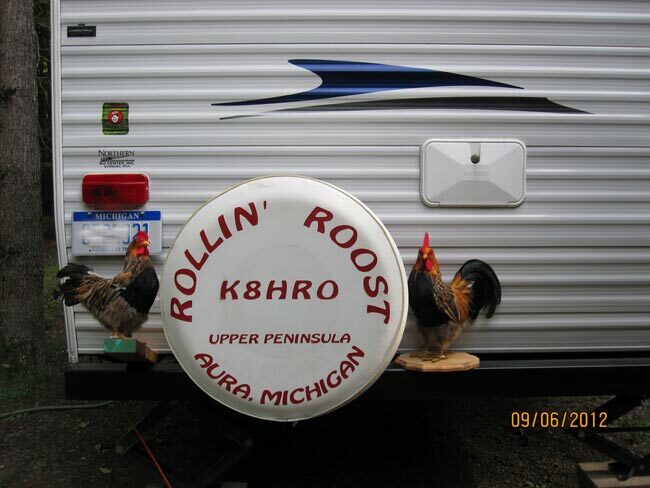 THE CHICKENS GOT TO GO ON VACATION IN THE CAMPER! Thanks so much for the cute chickens, I love them both. They went on vacation with us and we got a lot of looks and comments! I have named them, Sassy Soo and Rusty Roo. 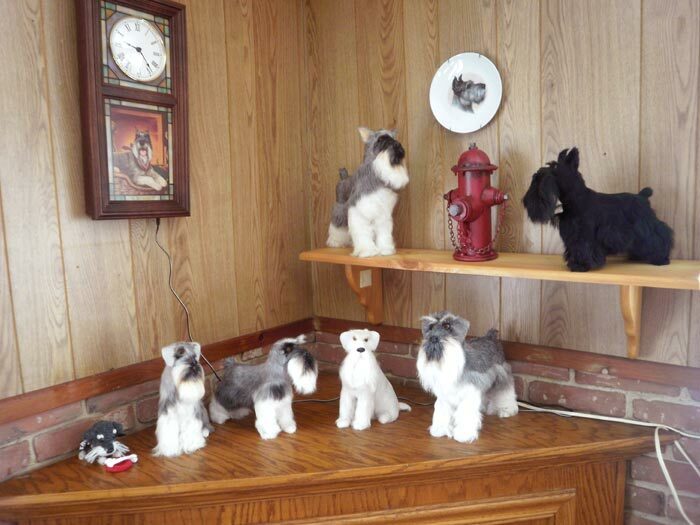 WHAT A GREAT SCHNAUZER DOG COLLECTION! 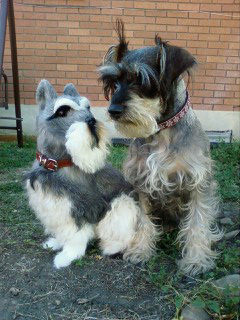 Here is a photo of my Schnauzer Collection. Thank you so much for having such beautiful items available like this for collectors. so see the picture below. 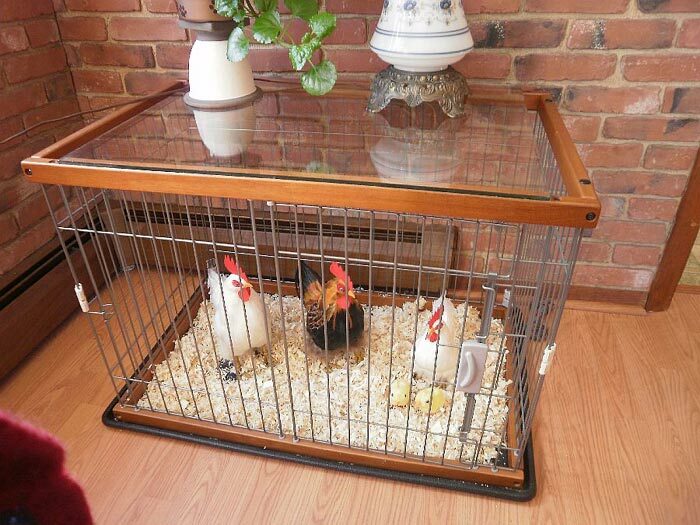 WHAT A BEAUTIFUL CHICKEN COOP COFFEE TABLE! They just arrived a little while ago, they are beautiful. Here is the table that I made out of Pepper's (my Schnauzer Dog's) crate that he no longer uses. I put a piece of plate glass on the top, and added at the bottom some of the wood shavings and the chickens make a nice display. I figured I would use the dog crate and make some use out of it. Here are some photos of "Charlie" my husband's little buddy. My husband wanted the bull dog on TV who could ride a skateboard. Since we can't have a pet I bought "Charlie" instead. He is the perfect pet for us. 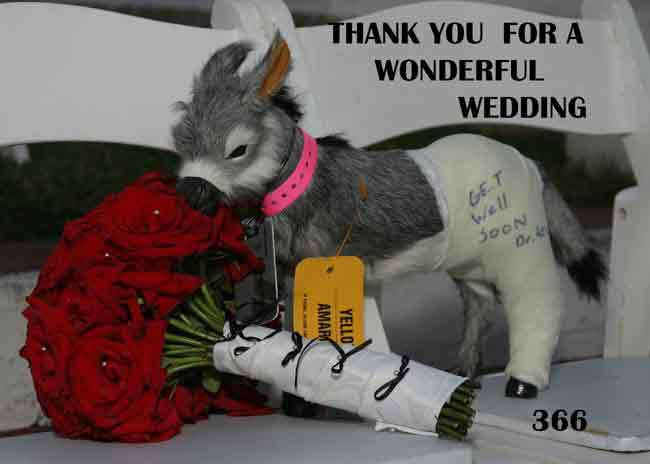 The following pictures are from a 30th Wedding Vow Renewal for Emily & Gale. 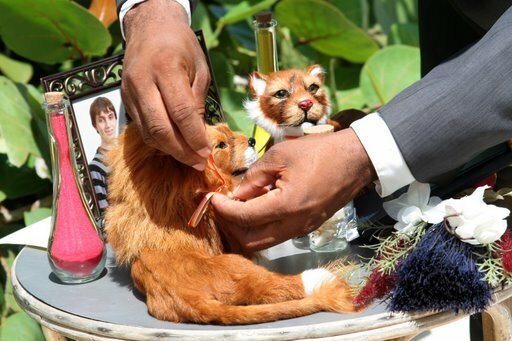 The ceremony was August 28th, the day before Hurricane Dean hit Jamaica. Not even the threat of a hurricane was going to stop us!! You are more than welcome to publish the shots of the lions on your website. Thank you for being part of our renewal. THE HAPPY COUPLE.....EMILY & GALE! Deb, Everything was fantastic. 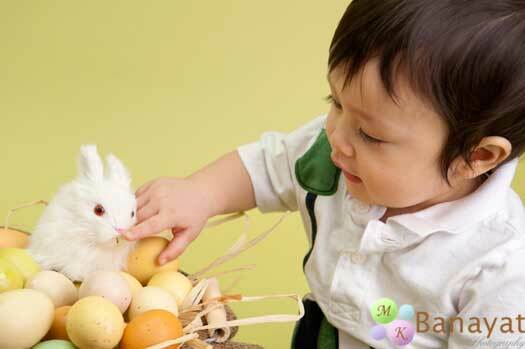 Attached are some Easter photos. Thank you for such unique props! 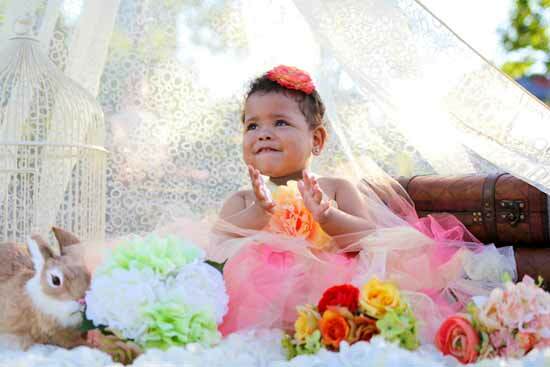 ANOTHER CUTE PHOTO FROM NICOLE ALBERTSON PHOTOGRAPHY! 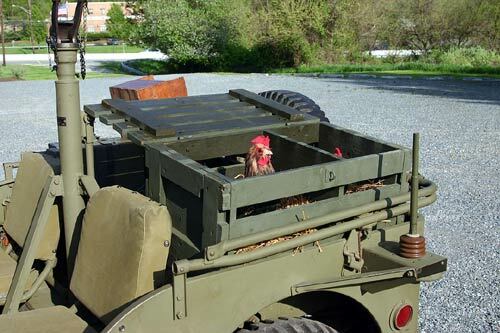 Attached are some pictures of my chickens with their new beaks on the 1942 Ford GPW jeep. Thank you again. 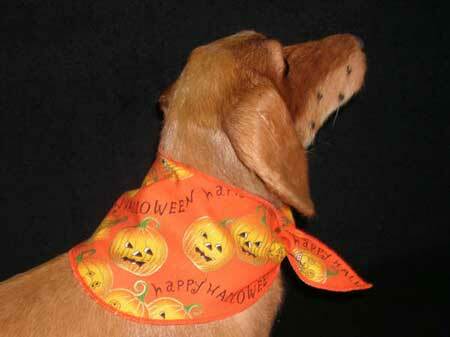 They are always a hit at parades and displays. Folks love the "spoils of war". Many thanks for helping me re-beak my birds. 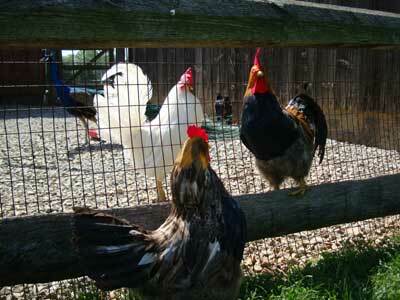 John had purchased chickens from us years ago and needed new beaks for the chickens. We were lucky to find some new beaks to send him. 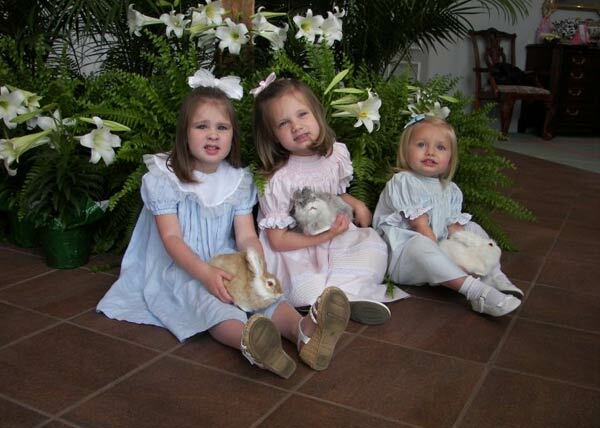 Alivia Grace, Anna Lane & Sarah Claire, ages 4, 4 & 3! The rabbits made the biggest hit and all the kids at church wanted one! Thought you could use this to add to your collection of happy children! 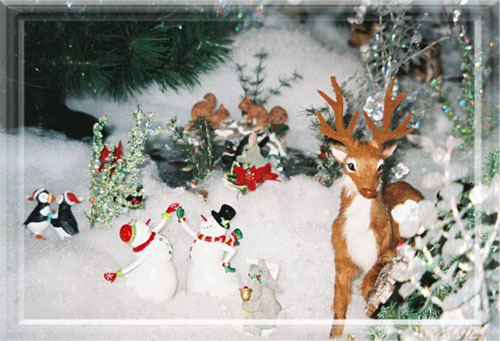 SANTA'S WORKSHOP HAS SOME NEW DEER! 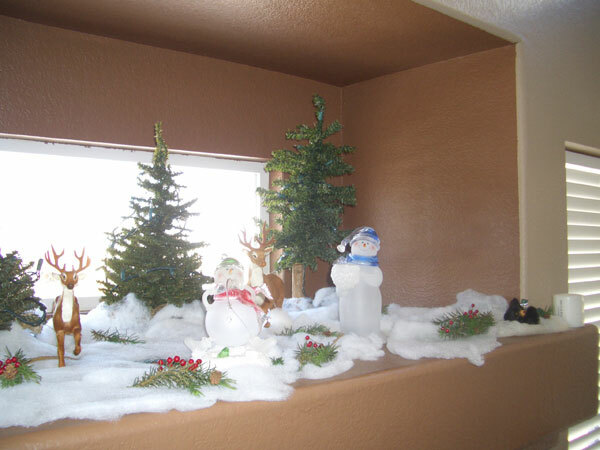 Here is the story about my Santa's workshop. I bought them, and proceeded to build a "Workshop" and eventually a "North Pole" scene for the three special pieces. Two Christmases ago I moved, and I LOST my three special Pieces in the move somehow...I was so upset, because it had become a tradition. My husband bought me a new Sleeping Santa and an elf so that the tradition could continue. Over a year later I found a box in my furnace room that has Santa and his two elves!! So now I alternate them. 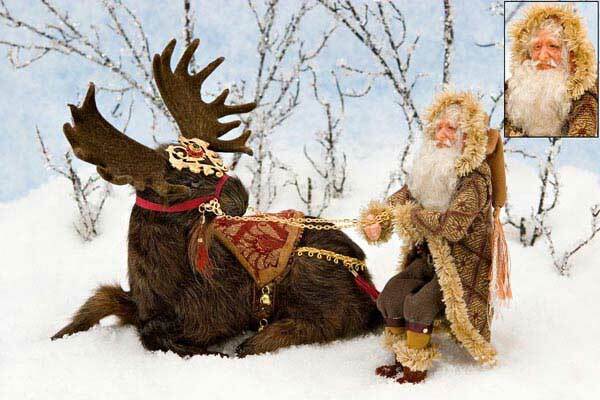 I look every Christmas for items that will fit scale-wise and add some special touch to the North Pole. It has grown to take up about a 12'X5' space now. As my children got older they started giving me Charming Tail characters for Christmas gifts...and the collection keeps growing. One year when they were 10 & 13 they sat for hours making tiny letters to Santa to go into my "mail box". 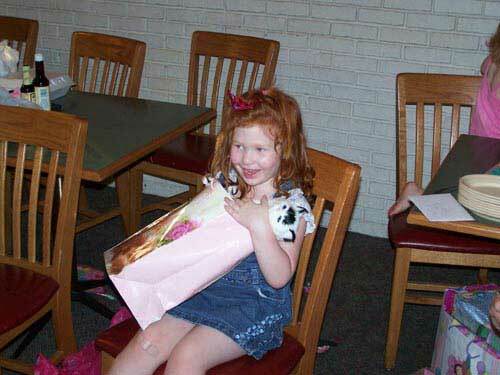 I still have those, 11 years later, and you can see them coming out of the box in one of the photos. 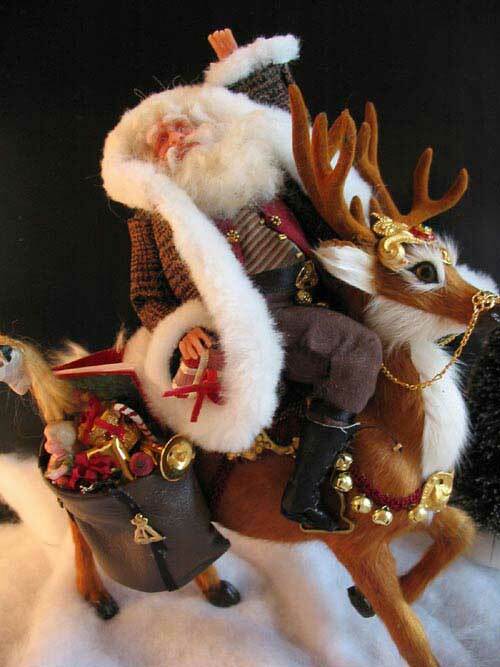 The Deer are of course an invaluable part...Santa MUST have reindeer!! Thank you for being a part in my family's Christmas memories. My children still come and "check it out" every year, and someday perhaps....my grandchildren. 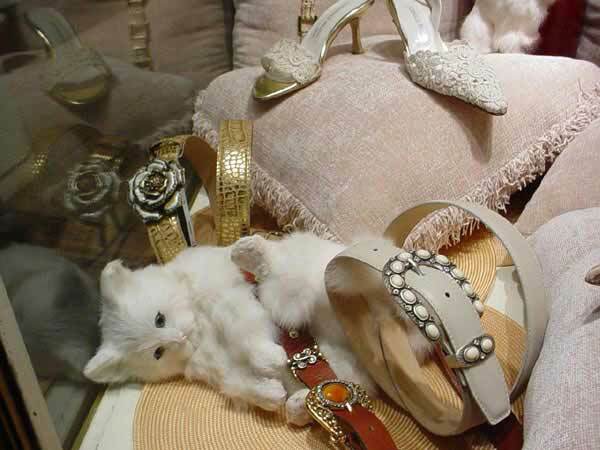 saccharin-faced dolls. My Characters soon became popular and my hobby expanded into a full time vocation. beautiful Daniel Island, SC. Each character is different, unique and, I believe, has it's own story to tell. 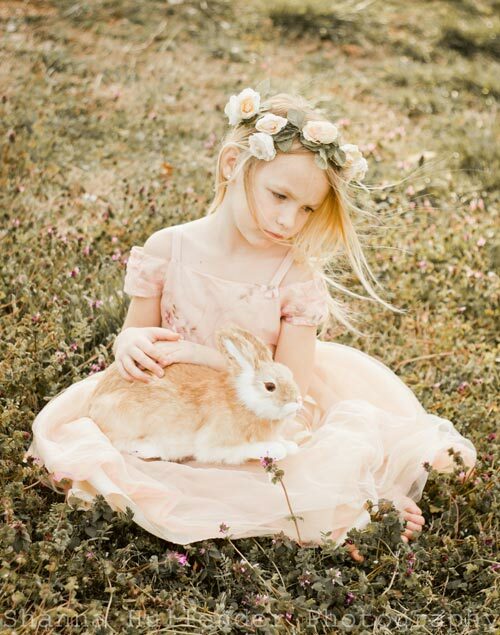 REALISTIC BUNNIES & BABY DUCKLINGS MAKE GREAT PHOTO PROPS! 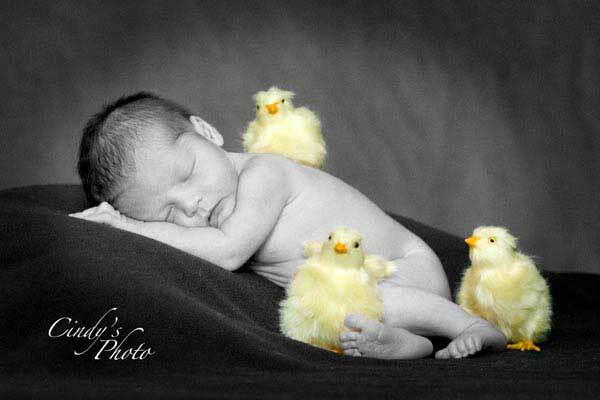 THE BUNNIES & BABY CHICKS HELP CREATE BEAUTIFUL FAMILY PHOTOS! 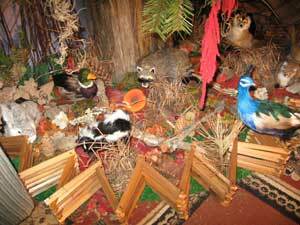 I loved the animals they look so real, here are a few photos of my grand daughters. 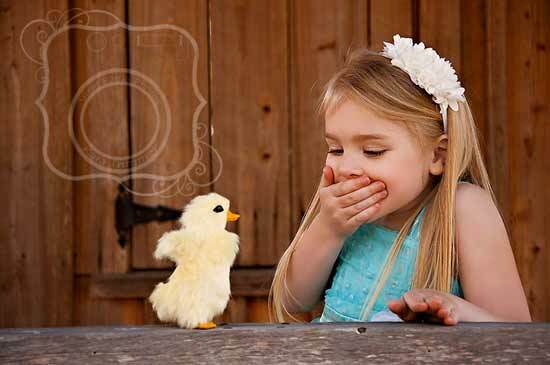 THE BABY CHICKS ARE SO MUCH FUN FOR EASTER PICTURES!! 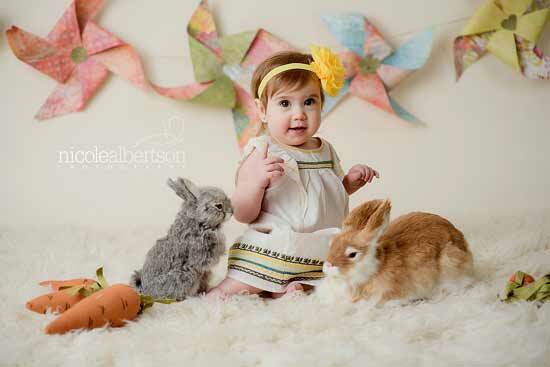 The realistic bunny and chick props worked out great in my Easter pictures this year! Attached are some photos of two of my favorite subjects, Noah, age 2 1/2, and Rachel, age 9 months. 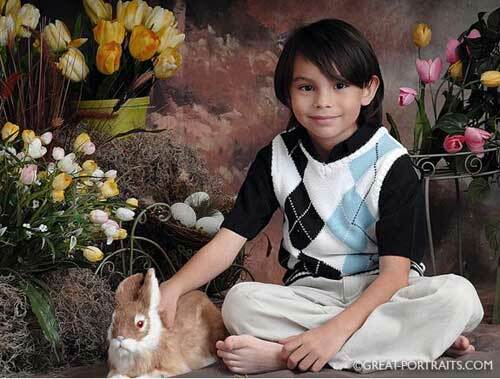 Noah actually named the bunnies Hopper and Stinky, and loved to "feed" them carrots. 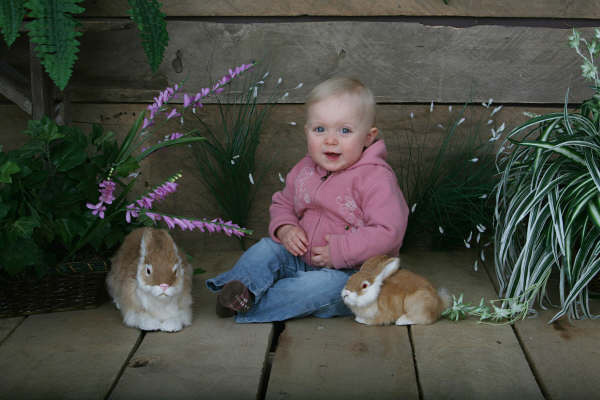 As you can see, the props were so realistic that Rachel was excited with the chicks and mesmerized by the bunnies. Absolutely precious pictures!! Thanks again for your great customer service and quick delivery. CATE HAS A WHOLE COLLECTION OF KITTY CATS LARGE AND SMALL!! Thank you so much for our new babies. Cate is in love :) My other 2 granddaughers have already said they want some too! Her Sunday School class loved them at church Sunday-good little Southern Christian kitties! The 2 Dogs arrived today...I use the Dogs & Cats in my Displays....I get a lot of comments from people asking about them...where to get them, etc.....This is a Doll called Ellowyne Wilde...She is 16" Tall and I sell her outfits on Ebay....She always has one of your animals with her as she models the outfits I sell. THE WHITE RABBIT STARS IN DON'T DRINK THE WATER. 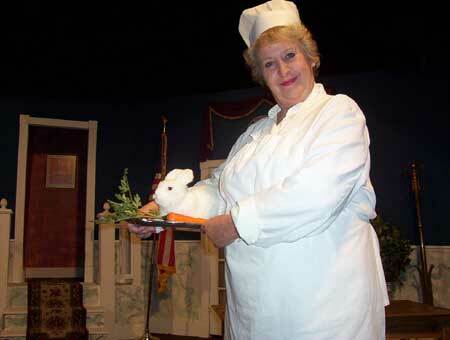 Thank you so much for the opportunity to have one of your rabbits star in our production of "Don't Drink the Water". As the director, I was worried about where I was going to find a realistic looking rabbit. You answered my prayers! And thank you for the fast shipping. Everything was first class! 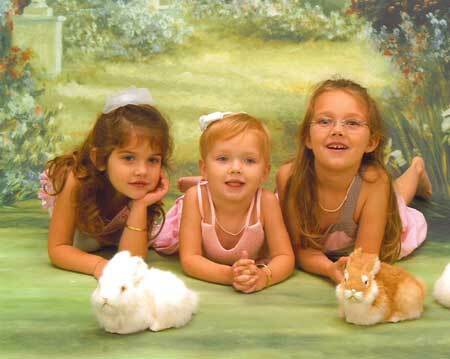 Here is a picture of my girls, Alyssa-5, Katie-3 & Natalie-2 with the bunnies. I saw your bunnies on a photographer of mine blog, so I Googled and found you. 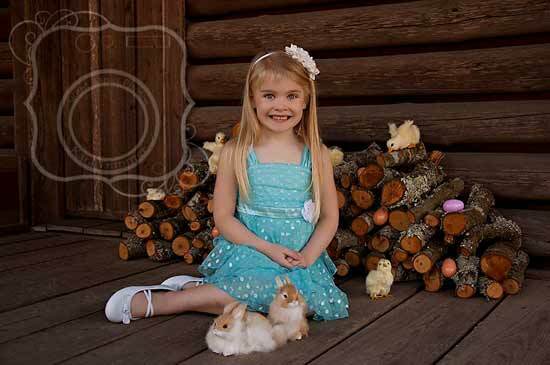 hopefully we can use them for more Easter Photos. Thanks for everything. We are very happy with your products. Here is a Sample Picture. I'm glad that you like my picture and it would be an honor for you to publish it. I will send more pictures as time goes by. Jack arrived and he is ADORABLE!!! THANK YOU! Gotta run...but, have attached pictures of your two doggies wearing Merry Meg's scarves. 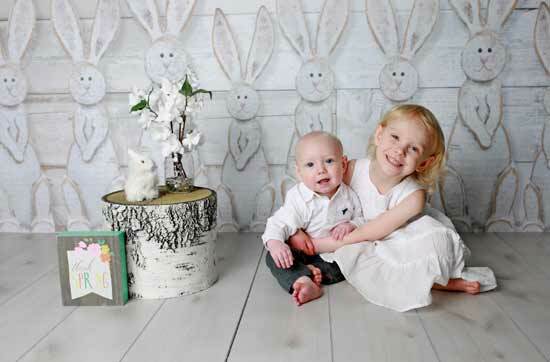 THE BUNNY IS USED AS A PHOTO PROP FOR GREAT EASTER PICTURES! Yes Deb... received the order, and I love it! 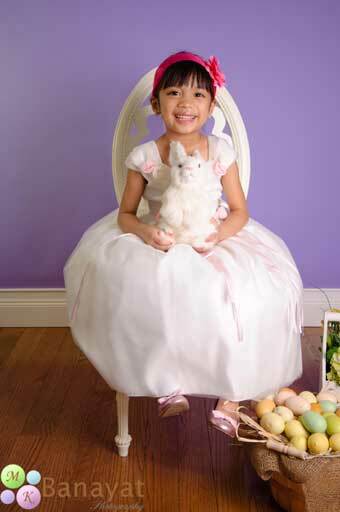 Great for Easter pics! Joanne purchased a Rooster & Hen for her Farm where she has chickens & a peacock. 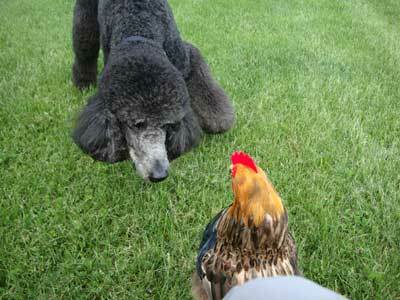 She also has two poodles that love to play with the chickens! Attached are several photos of my boys at the farm near the chicken coup....enjoy!! Here is the project that my sister and I put together for our other sisters. 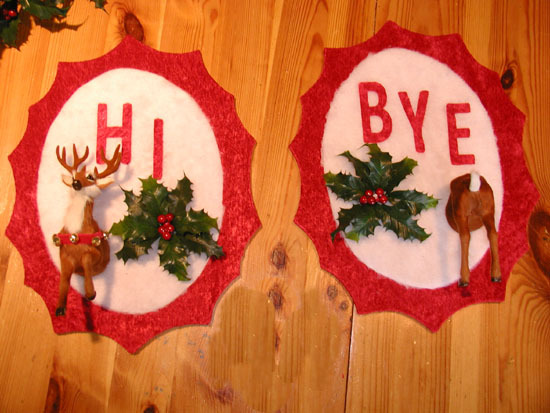 We had ones similar to these hanging up in my parents home when we were young. 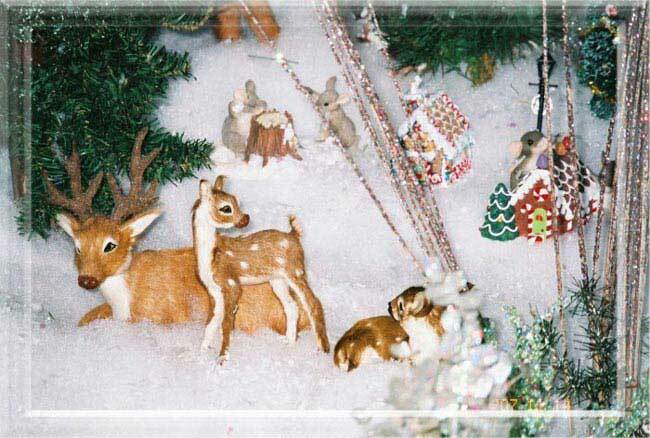 My Mom's set were made with a red reindeer I believe, but we are every happy with the more realistic looking deer. They fit perfectly into our gift for our sisters. Thank you for checking. I did receive the Llama and it was a big hit. I actually gave it to my good friend's husband as part of her "dowry" for her wedding. 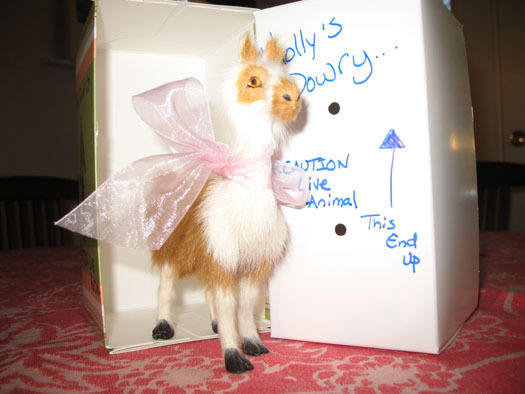 (Her husband spent many years in the Peace Corp. and asked for a llama as a dowry instead of sheep or cattle (haha)). Anyway it has a good home. 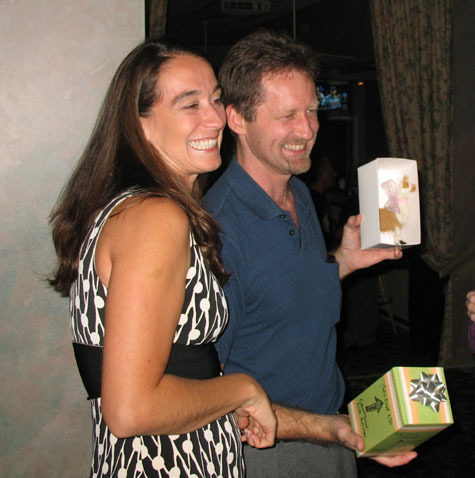 DEBORAH PRESENTS A BOUNTIFUL DOWRY TO HER FRIEND'S NEW HUSBAND! 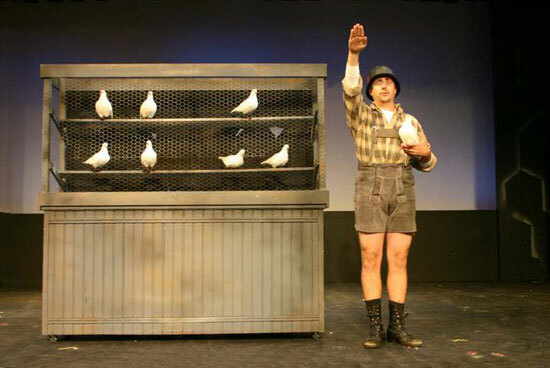 THE PIGEONS PERFORMED IN THE HIT MUSICAL "THE PRODUCERS"! We adored the pigeons you sent us! They looked great on stage in our production of the Tony-award winning hit musical THE PRODUCERS. They even managed a bit of "choreography" in their comic scene--they were a real hit. Our Barn Theatre in Augusta, MI is located in Southwest Michigan and we are the oldest resident Equity summer stock theatre in the state and maybe even in the country with so many theatres going under. Attached is a photo that you are welcome to post on your website--they look great. I can't thank you enough, once again for your wonderful help with the pigeons. You were just delightful and I thank you from the bottom of my heart! Credits should go to J. Robert Schraeder/Coterie Theatre. 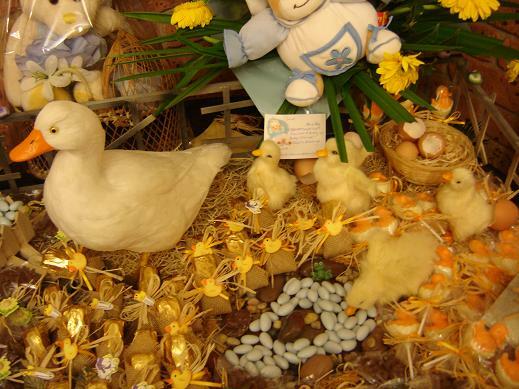 One of the Five Best Theatres for Young Audiences in the U.S.
"groundbreaking...one of the nation's most respected"
Hi Debbie it's Marian from Australia, I purchased the ducks and ducklings from your website to make a design feature for my new born sons chocolates. 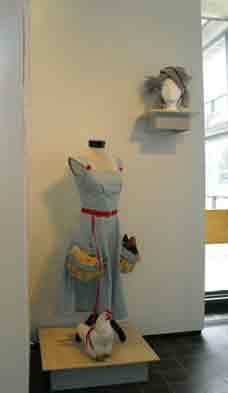 I have attached the photos of my design with your product, I hope you like my idea. 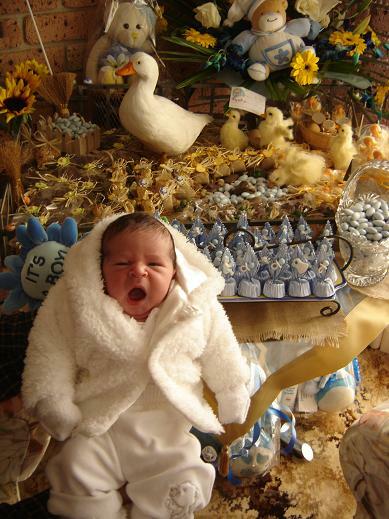 I designed the chocolates arrangement for my new born son, Charbel, that you see in the photo, so when I get visitors at home I would give them some chocolates as a thank you for coming and giving me gifts. 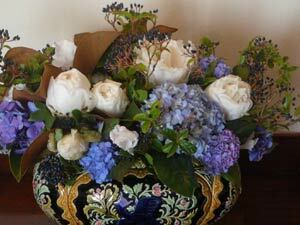 This is why when I saw your website the ducks and ducklings fitted perfect into my arrangement. Thank you for sending them out to me and I hope to hear from you soon. 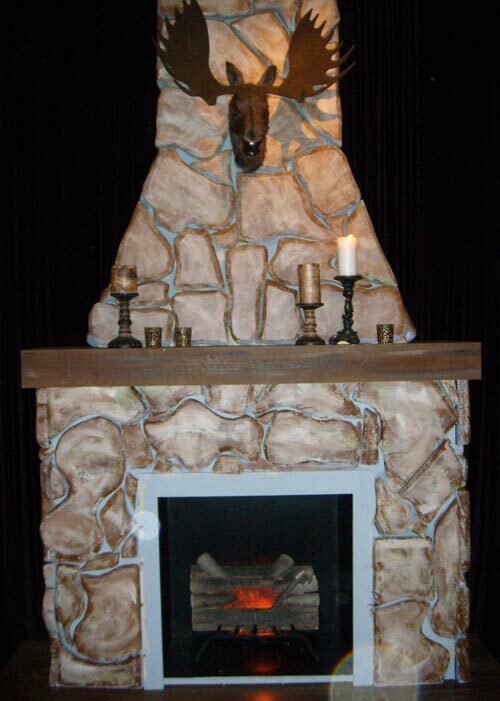 Thank you very much, we will be buying some more next fall to fill in our display above our fireplace. Thanks again for the great service. Take care and stay warm up there! 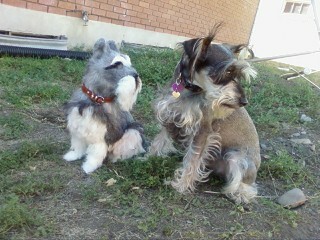 CAN YOU TELL WHICH SCHNAUZER DOG IS A REAL DOG?? THE DOGS ARE HAVING LOTS OF FUN PLAYING TOGETHER!! Dear Deb, I got them last night! They came early yay:) I came home late last night of a hard day and I was feeling sad when my family said I know what will make you feel better....lol. I already knew, and said where are they! I ran to my room and locked the door so I can be the first to see them, haha. I opened the box like it was Christmas morning again, and I just awwed and felt all warm inside the moment I saw his grey fur before I even got a good look at him lol :). I took him out and just admired him, and pet his amazingly soft fur, and you'll probably think I'm funny but I couldn't help but hug him! lol I am so glad I got him, he's beautiful and is just perfect! I really like him alot, he's exactly what I wanted. 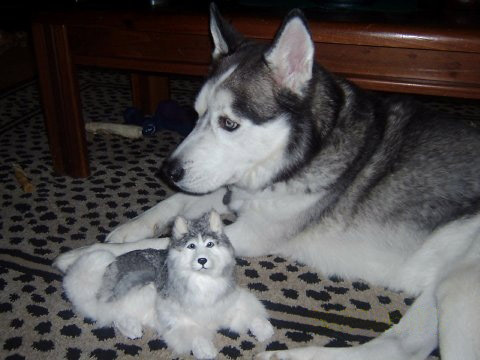 Sheena likes him too, he's slightly smaller than her but I'm definately going to send you pix of them together soon :) He's a beautiful dog, I adore the Schnauzer and rough collie breed and I think you all did an amazing job re-creating these beautiful dogs! The wolf is extremely beautiful as well! 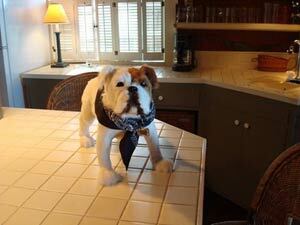 He looks very lifelike for his small size and I think my mom is going to be very impressed and happy on her b-day! Thank you for my new little friends. They have become my new favorite decoration and I'm very protective over them, lol. I'm sure they will become my new favorite collectable hobby in the future and as gifts :) I'm very impressed with them, thank you alot Deb!! 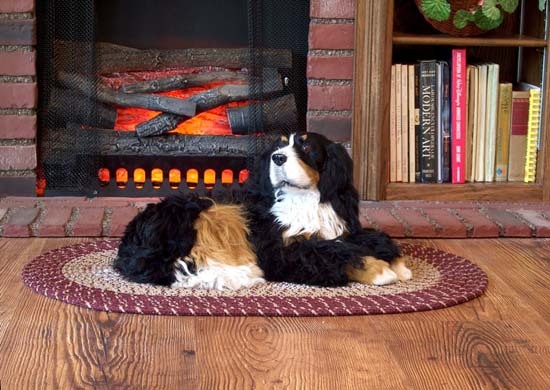 THE BERNESE MOUNTAIN DOG HAS FOUND A GREAT HOME! 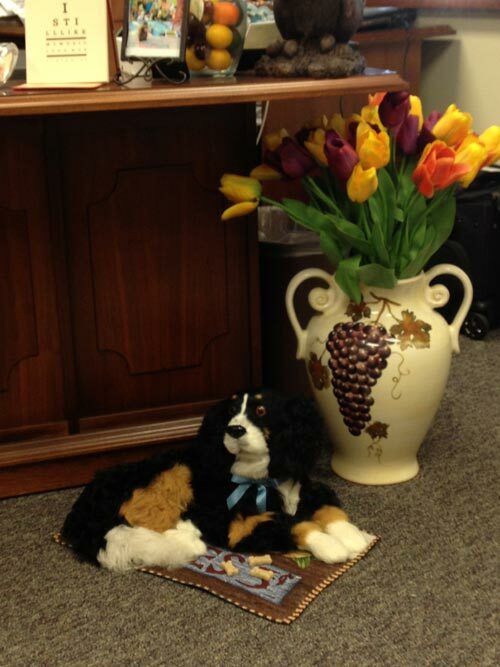 "Bernice" sits nicely in the alcove under my desk on a little rug with 3 dog biscuits. No one comments on the size...only her sweetness. A visiting colleague came to my office and passed it to get a cup of coffee from the kitchen. He stopped and said "Hello Puppy" and then did a double-take as he thought it was real! I look forward to more things from your shop in the future. 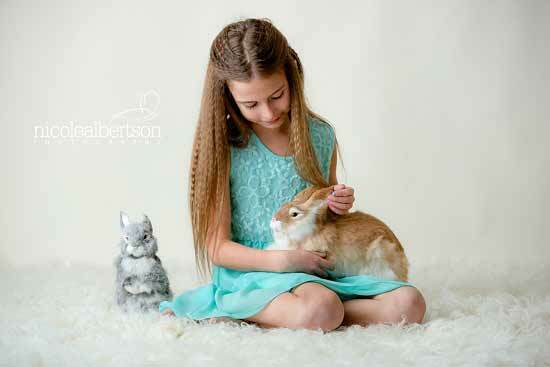 I LOVE the rabbit and ducklings and will be ordering more for next year's spring photo sessions. The kids loved them, and everyone looking at the photos thought they were real. They were a big hit! My clients loved them! They are a big hit with the kids! 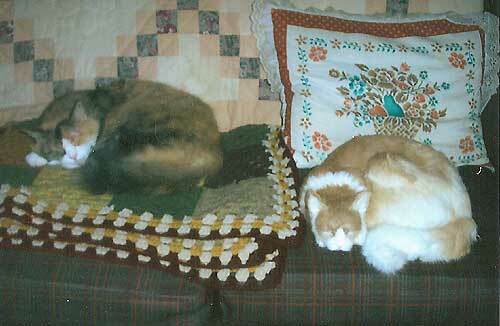 I put your cat next to my sleeping cat Rory on left, took the picture, and she was none the wiser! Anyway, my mom is just thrilled with the cat. She wanted me to wheel her around the hallways to get reactions. Everyone thought it was real. Yesterday when the Dr. came in, he was very wary of reaching over the cat with his stethescope even though we assured him it was fake. Lots of laughs at reactions. Kitty is sometimes in a basket & blanket on the floor which causes alot of people to jump too! Thanks so much for bringing joy & laughter to Wiley Healthcare. I just got the Unicorn, Buffalo, Kittens & Bunnies from you and wanted to share this picture! 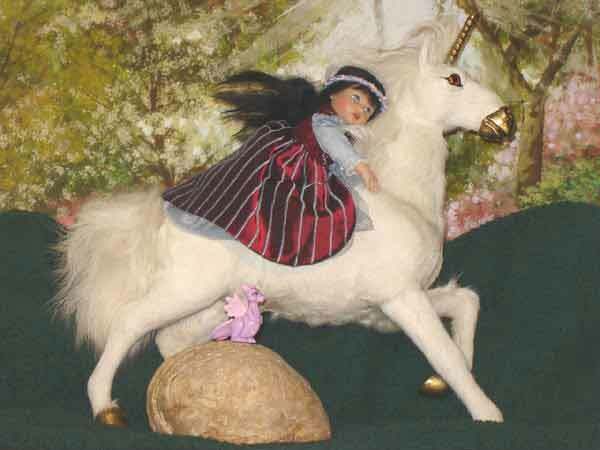 My Snow White Riley is riding the Unicorn through the forest. Notice her hair and the Unicorn's mane & tail blowing in the breeze? 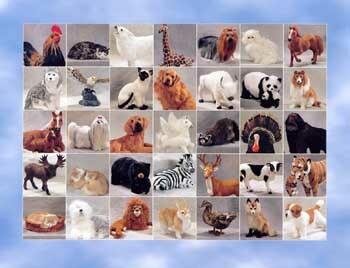 Thanks so much for these wonderful animals. I will post positive feedback and recommend you to all my friends. I have a wonderful picture planned for the Buffalo, as well, so I will share that one when I get it done. Many thanks, your work is magnificent! them in time for the photo session. 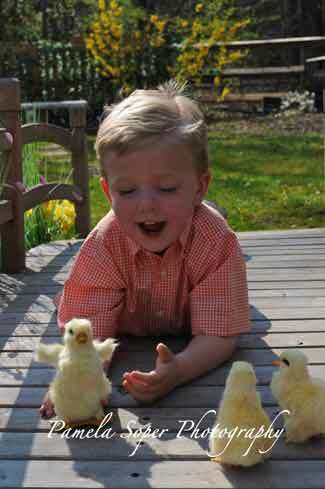 Here is an image taken just after I received the little chicks. The images we capture today become the windows to the past in the future. Just wanted to share a couple pictures of our egg "girls". 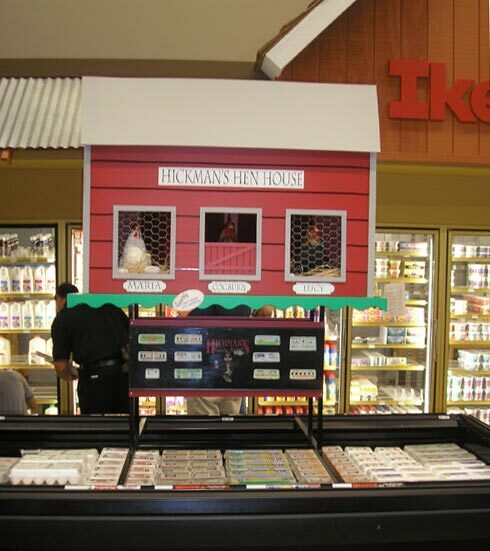 They are sitting pretty in their Hickman Henhouse perched over the top of our egg display at Ike's Farmer's Market in Tucson, Arizona. 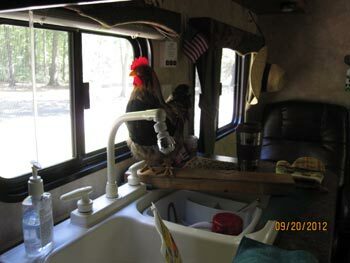 All of the girls, and Cogburn the Rooster have a room with a view! once he sees you flash some dough! 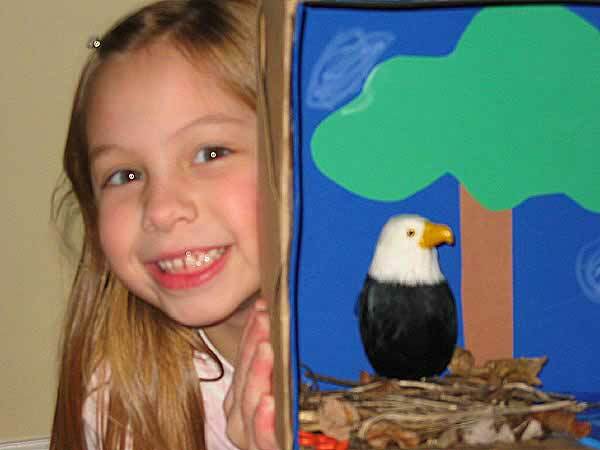 Yes, I did receive the Eagle and my daughter's habitat turned out great. Attached is a photo. THE CHICKENS ARE A BIG HIT AT THE PARTY! 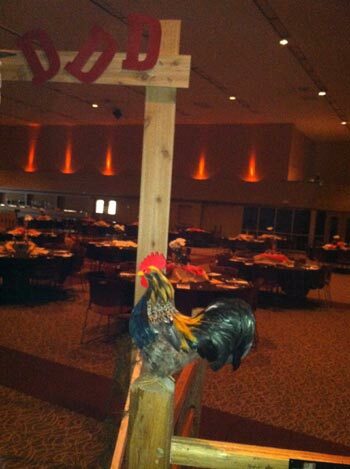 I am a children's event planner and I am doing a Barnyard Theme. 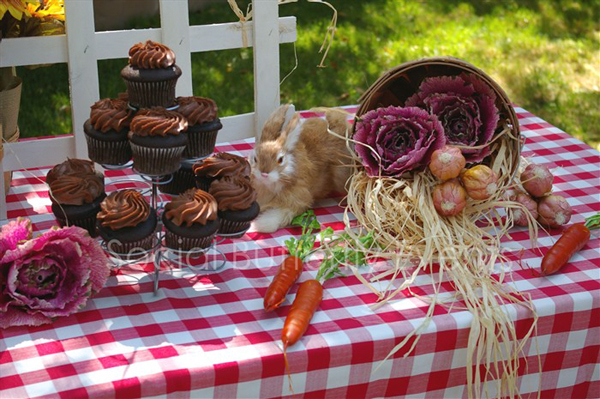 The chickens and chicks will act as my centerpiece and the rabbit will be on the food table adorned with fake carrots, radish's etc. 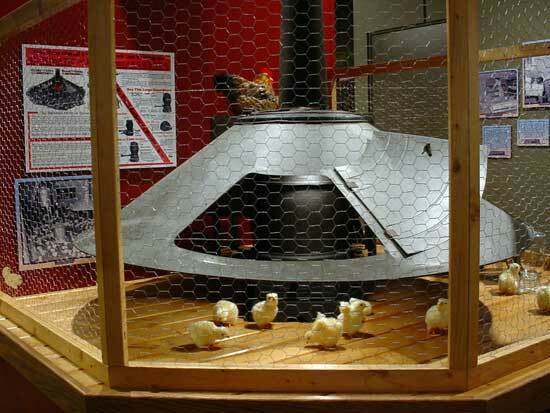 THE BABY CHICKS ARE STARS OF THIS MUSEUM EXHIBIT! 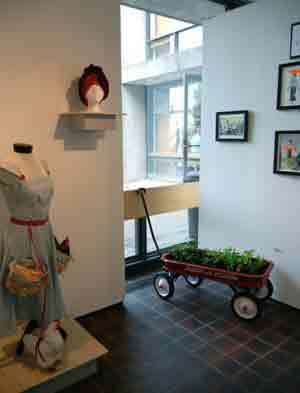 Hi, attached are some images from our After the Farm Chores are Done Exhibit which opened last week. They look quite nice and visitors have gotten quite a chuckle over them. 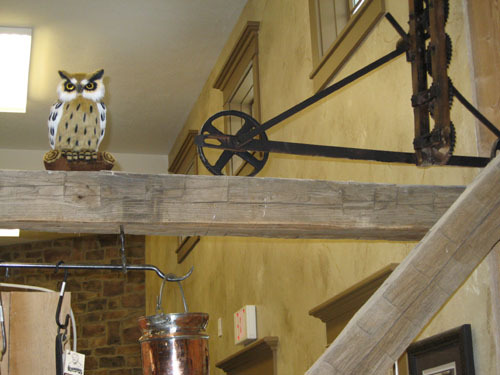 Here are some photos from Lehman's retail store in Kidron, OH. Part of our recent expansion involved the renovation and rebuilding of an 1840's era barn -- that's why we purchased the animals from you. 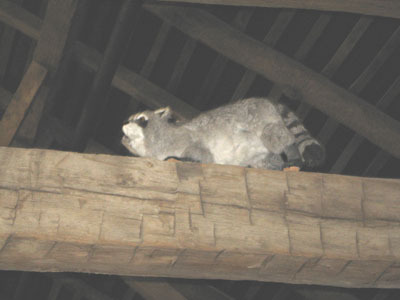 The first time I saw the barn, it was full of hay and equipment and critters...including a raccoon and an owl. 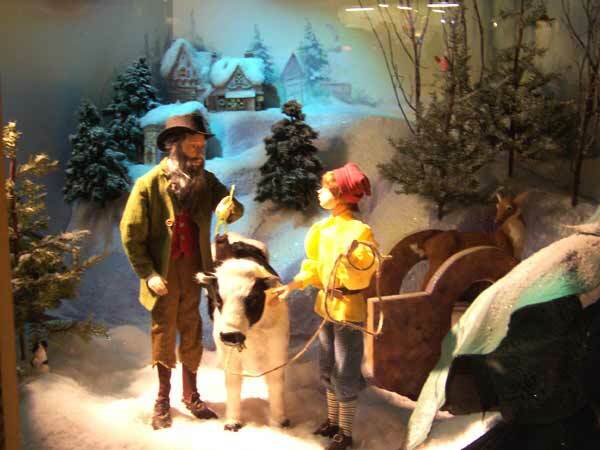 So when we took it down, moved it and rebuilt it inside our retail store, I didn't ever want to forget that it was an actual working barn for most of it's life. Hence, the critters. Enjoy! The unicorn arrived this morning and he is lovely....I am delighted with him. Thank you so much for your help and such wonderful service. I thought you might like to see what I have done with the lovely unicorn. I repainted his hooves in a pink/gold sheen paint with iridescent glitter and I glittered his horn with gold and holographic glitter to make it sparkle. 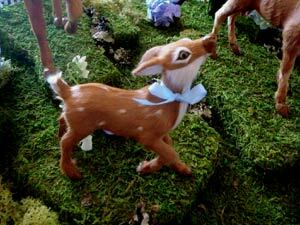 Then I "dressed" him in silk and braid an decorated his mane and tail with tiny miniature flowers and silk roses. 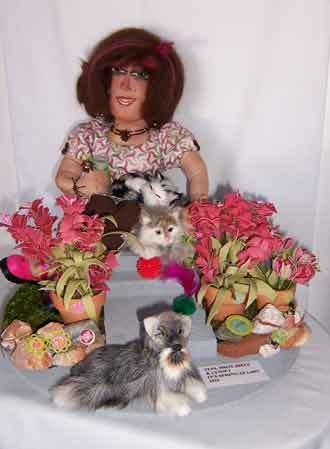 All of my miniature character dolls and fairies are entirely hand crafted to order and are individually made. 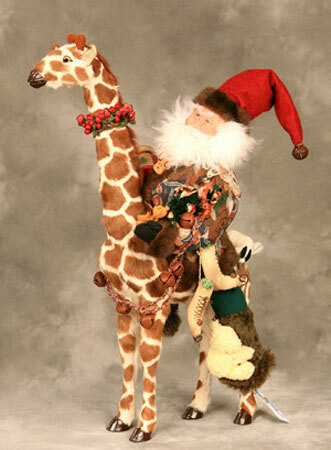 Yes, I will certainly contact you if ever I need animals for my dolls. Once upon a time there was a beautiful princess who longed to fly to the moon. One starry night, she awoke to hear a tapping on her bedroom window. 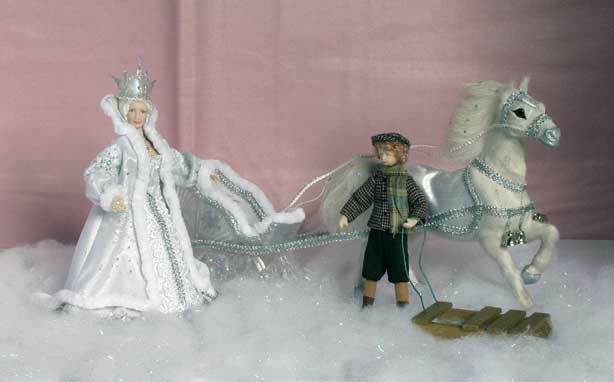 There stood a magnificent white winged horse. Before she knew it she was soaring up into the midnight sky, safe between his huge strong wings. Could this be real or was it just a wonderful dream.......a simple flight of fancy? 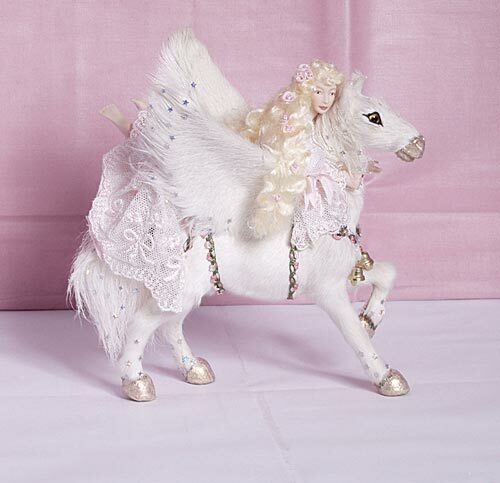 A one twelfth scale miniature porcelain doll on a stunning white winged horse. 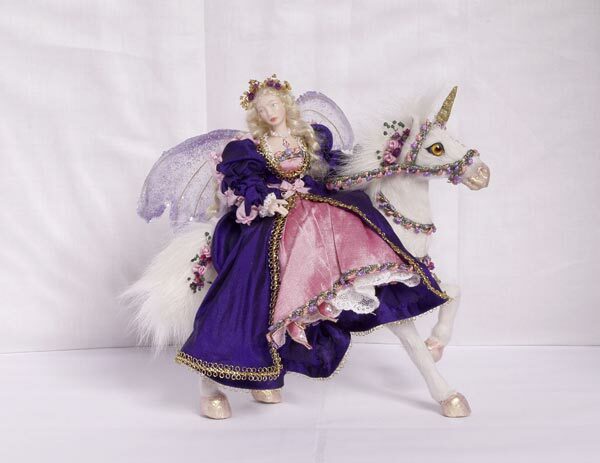 The magnificent winged horse wears a silk �coat� embellished with pink and green floral braid. 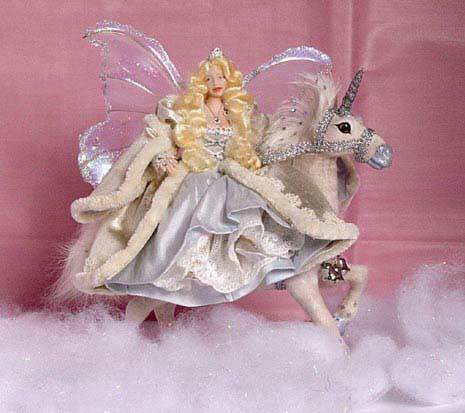 His hooves are painted with pink/gold pearl paint and his wings, legs and mane are studded with dozens of tiny holographic stars. 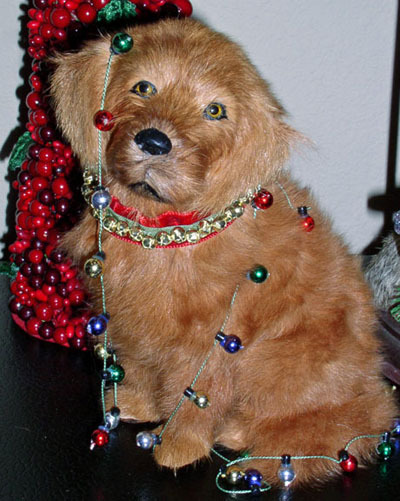 On his chest hang two tiny golden bells. A truly magical ensemble! Yes, I got the monkeys! 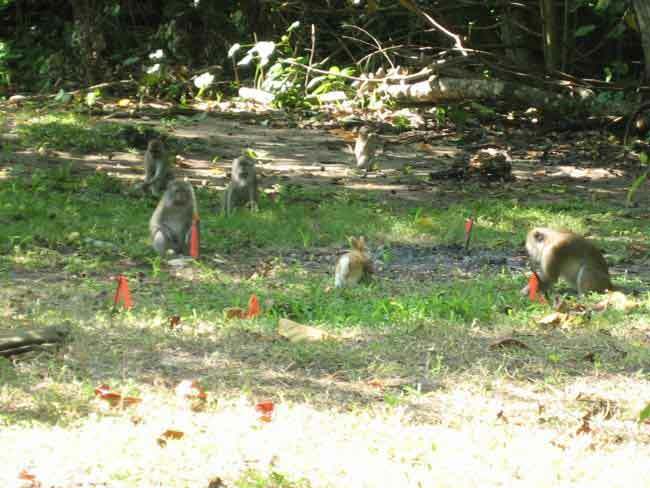 There's a whole bunch of monkeys over here! They looked great, I only wish they were available life sized! It was take-the-kids-to-work day. 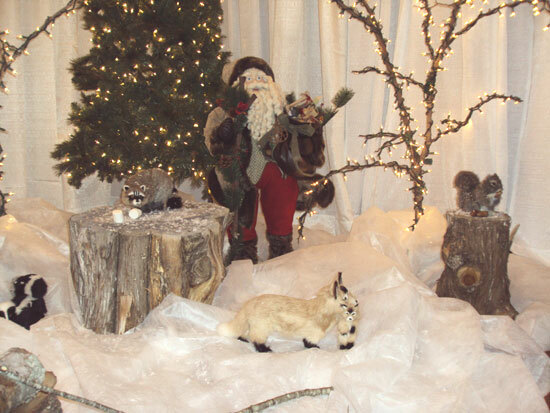 Kids of all ages enjoyed these cuddly creatures at this "It's a zoo in here" themed event designed by Alicorne Productions Inc.
have the opportunity to use your furry friends again! 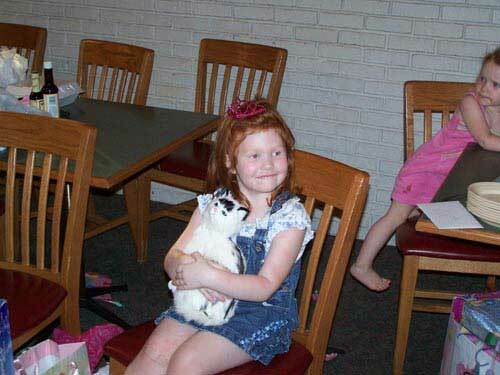 I did receive the Kitten and it was given to my 4 year old daughter Trinity for her birthday. She sets it by her bed to let it watch her while she sleeps so no monsters will get her. She will tell me "It's almost real momma." The funny thing is that it does look so real. 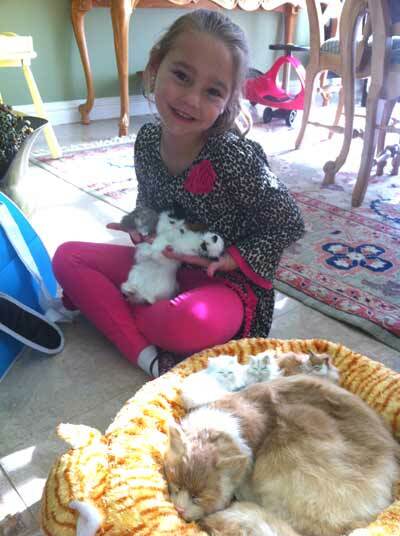 She cannot have cats or dogs due to allergies, so she has finally got a cat like she has always wanted. We will be purchasing more items from you in the future since I have three girls. 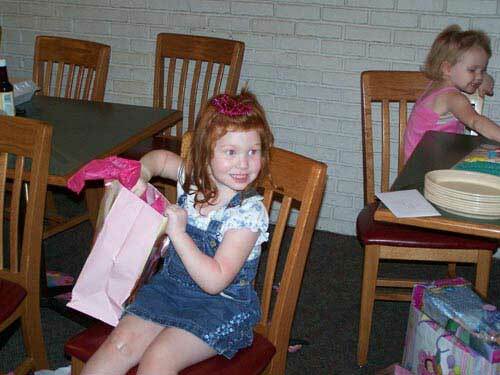 I believe this was the best gift she could have gotten for her birthday. You do amazing work. Thank you so much for the best gift my daughter could have received. The kitten is wonderful. I am sorry the pictures do not show the kittens face, but she would not let it go to show us what it looked like for picture sake. he will be using it as a prop in a film he's making this summer. We'll see if the REAL baby ducks in the film are fooled?? 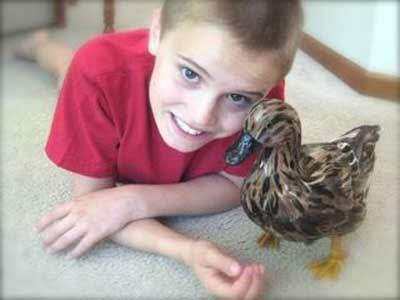 We used the duck for an Aflac Photo shoot. This picture is a simple shot as we just used the duck for a lighting test, to see how the feathers would look under certain lighting, etc. I hope this shot is useful to you for your Snapshots Page. Thanks again, your little duck was most helpful to the end result. 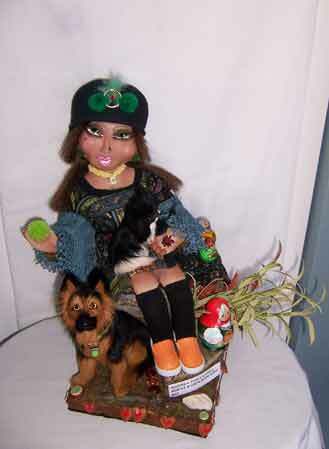 A few weeks ago, I bought a Yorkshire figurine from you for a play that I was directing. The dog worked beautifully for our purposes. I received everything in plenty of time. Thank you. Here are a couple of pictures for your album. 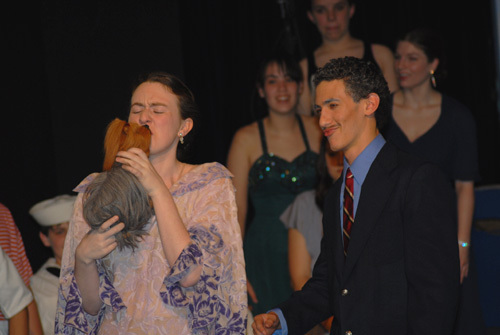 We did a production of ANYTHING GOES, and one of the characters had a little dog she carried throughout the show. 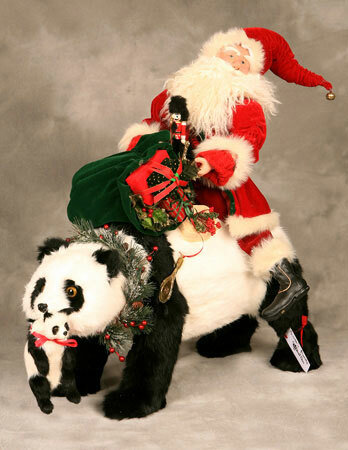 I will recommend your company to anyone looking for plush animals. They are terrific. a baby at the age of 3, 6, 9 and 12 months). I haven't found animals like yours here in Europe. They look so real, amazing! I'm so happy I found your website. 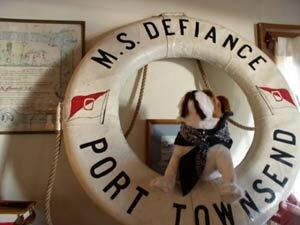 This past summer, I bought my 7-year-old daughter a furry kitty in Key West. She loved it so much she couldn't wait to get another. 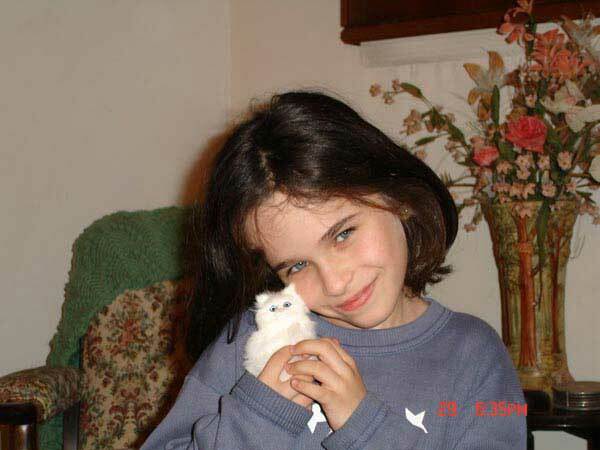 Not planning to go back to Key West on vacation anytime soon, I ordered a little white kitty off your site for my daughter for Hanukkah. She knew I had ordered it and couldn't wait to open her gift (a day early; I couldn't bear to keep it from her any longer!) Now she can't wait until her birthday so she can get more kitties. Good thing her birthday is next month!!! 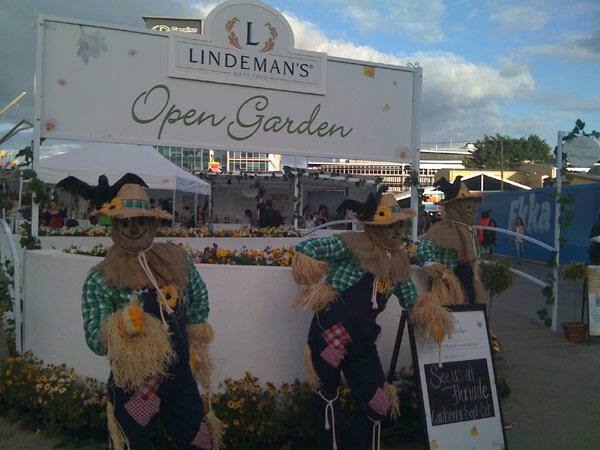 The Spring Flower show is held every year in the Central Mass area where all Landscapers, Masons, and Garden Nursery's build a Garden display. 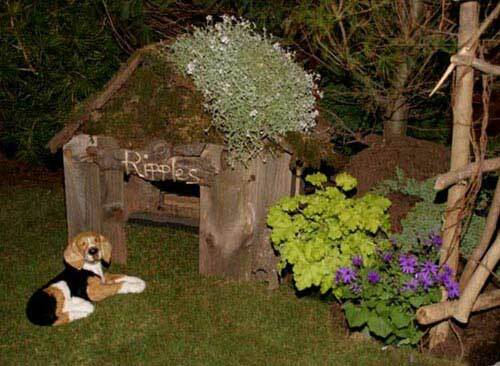 People who live in the local area come to view these garden displays and get ideas for their own home projects or hire the professionals to do the job. It's lots of fun and it gives you great exposure for your business. Thank you again for making our display a success. All our hard work paid off with 7 ribbons, a silver plate engraved for the most Meritorious exhibit, a silver medallion medal with our names engraved and voted 1st place #1 people's choice! Linda & I still can't believe it! 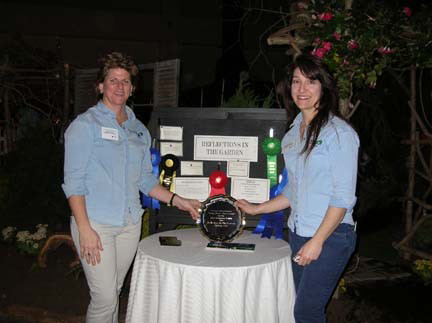 Below is a picture of us with our awards. I give our your name and number on a daily basis. I hope these people are calling you and placing orders. In the attachments you will see why people come in asking for your number more than even pay attention to the merchandise! Hey they stop to look, and that's what counts I guess. We sell women's shoes, handbags and leather jackets. We are only a year old in this location. Most of our merchandise comes from Italy. Hi, You Guys & Gals! and never has to go out. Yes I did get the order just in time for Christmas!! Thank you so much for finding a cute kitty that meows. My daughters been asking for another. (maybe for Valentines!) 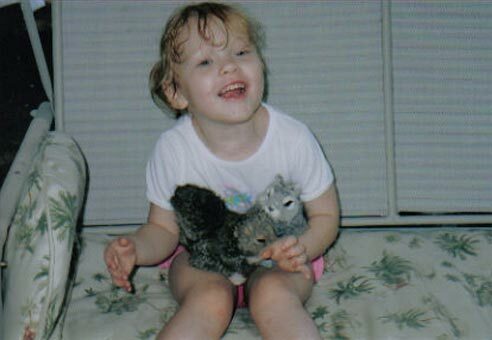 Here is a picture of my daughter, Kaitlyn, Christmas morning to find her kitty. Thanks for shipping the animals so fast. Here they are in a photo shoot the next day after they arrived. 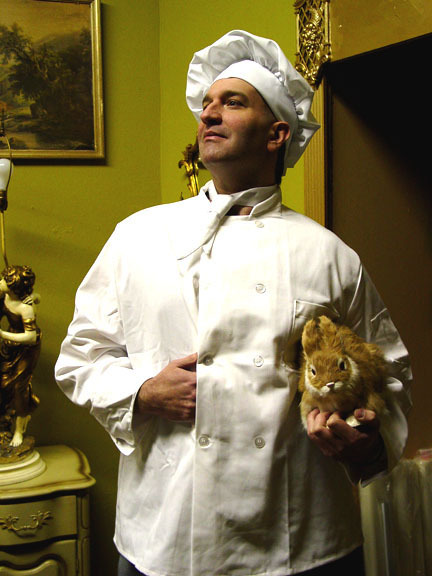 I do want to order some bunnies my upcoming promotion. Then moments like these are rare. A treasured picture a "Captured Moment"
A priceless memory to share. 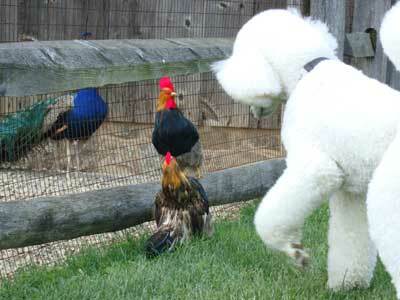 Hi, I just wanted to let you know what happened to my rooster. 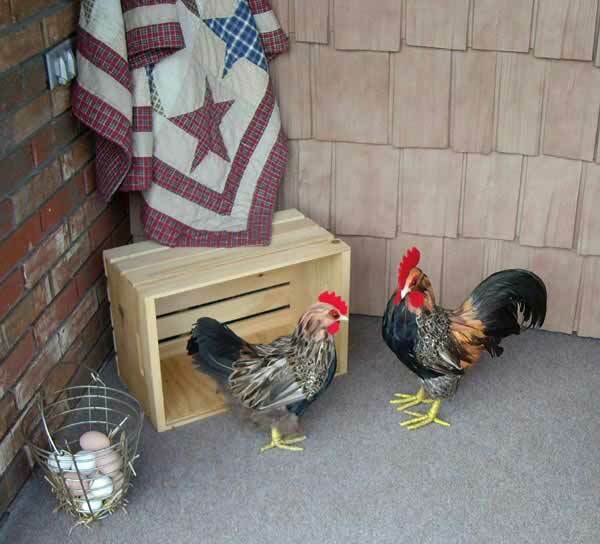 I got the hen and rooster Friday and set them up on my porch. We live in the boonies and when we got up this morning my rooster was laying in one of our chairs on the porch. I asked my husband what happened to him. He said he found him in the yard. I was sick about it. But, wanted you to know some varmint of some kind thought he was so real that it tried to carry him off, didn't bother the hen. I thought they has an odor of moth balls so never dreamt anything like this could happen. I love the items I received. 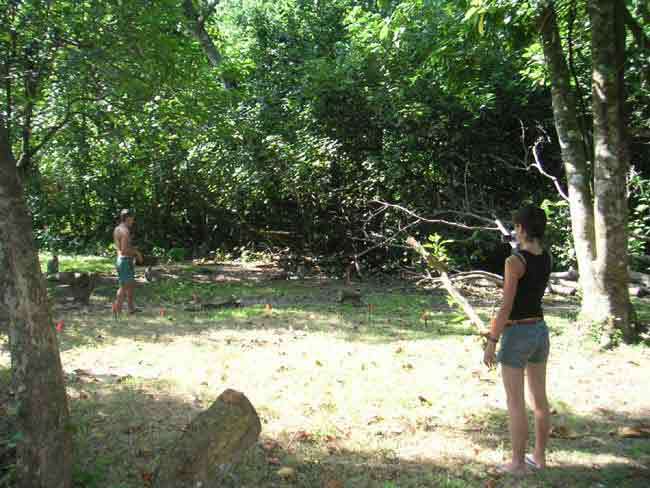 Your chickens can even fool varmints. LOL!!! I would have thought it funny but it made me down right mad. I will say that the only damage was one of his feet came off and I was able to stick it back on. Look like some of his feathers were slicked down, but all in all still looks pretty good. 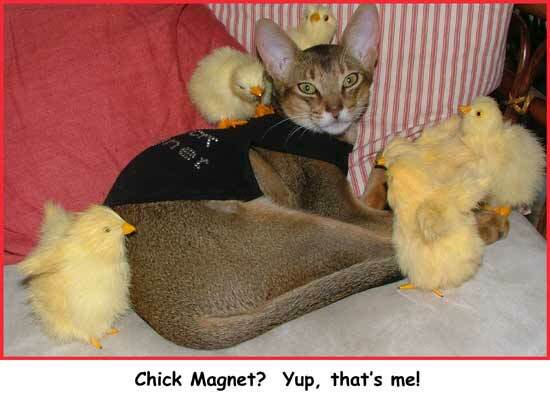 KIT CASANOVA IS TRULY A CHICK MAGNET! The page is called "chicks Love a Well Trained Guy". Just scroll down to the bottom. Everyone thinks they are real!!! P.S. Got a call from Jay Leno show requesting that Kit and I be guests on the show!!! Deb, thanks so much for all your help in getting those awesome wolves for us. I can't wait to see us on your page! Well I am the guy standing behind the group next to the girl with blonde hair. The story of the wolves are as follows: We are here with Campus Crusade for Christ in NYC this summer to help college students in their spiritual journey. As we were riding the majestic subway one day, it dawned on us that Wolves must roam these parts, so we began howling uncontrollably in the subway car. It was apparent from that moment on we would be TEAM WOLF!!!!!! Every day we would howl, bite, and growl, as we headed into the city. I already knew of your wonderful website that sold furry creatures such as wolves. I knew that I MUST have a PACK for my own team!!! Thanks for making our summer complete! We will forever be indebted to you and always display our wolves proudly. Two Paws Up!!! Just wanted to give you an update on the status of "Pool Party". The movie is in the final stages of post-production and we're hoping to have it finished in the next few weeks (in time for the American Film Market). Attached is a transition strip to show you how we took the dog you made for us, and transitioned it into the stunt dog for our movie. The last frame shows the actual dog (Lucy). 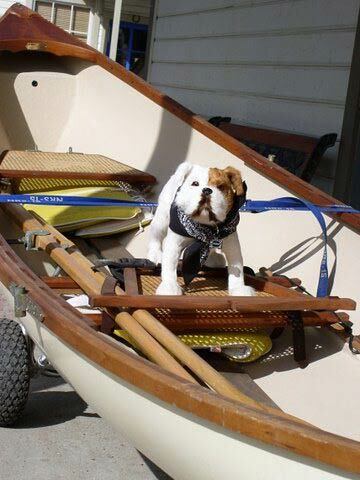 Your stunt dog was perfect for us--don't know what we would have done without you! LA WEEKLY NAMES THIS THE BEST WINDOW IN LOS ANGELES FOR 2006! It's ChadMichael. I bought the bunnies (which photos are on the way) and the owl. 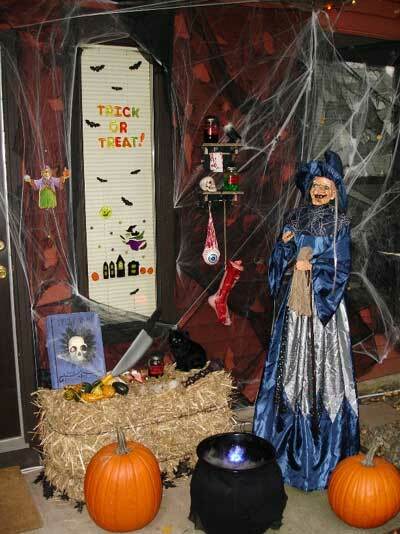 Here is a picture of my Bewitched window. The owl is of course on the broom. 2006 by LA Weekly. Thanks for supplying me with the right animals! Hi Love my bunnies. They are the closest thing to live ones!!!!!!!!! This is a glimpse of my Easter background. Thank you once again! 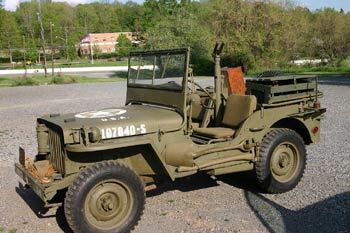 I occasionally set up WW II displays for town and community activities. 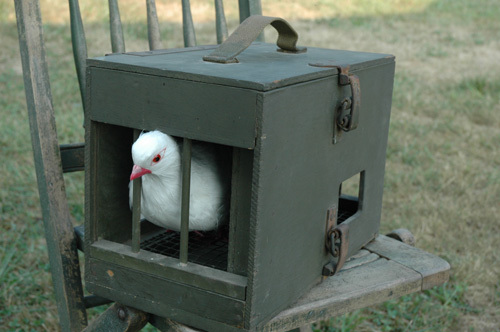 I have a jeep that I arrange a WW II Army Signal Corps pigeon box which they used to hold and feed pigeons to be used for communication purposes. They had little leg bands with a container to place the message inside. 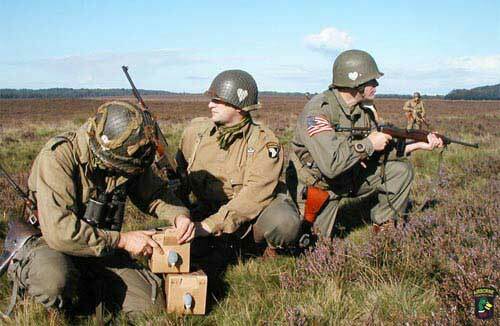 WW II Europe.....I have a couple of fake eggs. Deb, I did receive the moose heads! They were great. The Bat Mitzvah was a great event. I have received my cat today! Thank you. It is so beautiful and looks so much like a real one that my husband has been fooled! 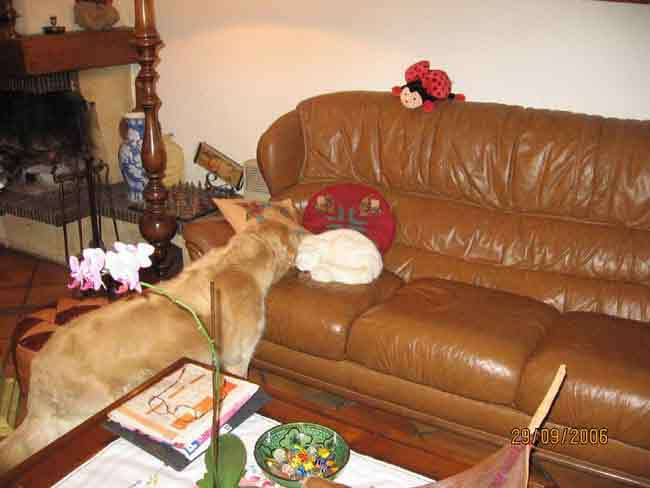 I am sending a picture of my dog welcoming our new pet.....I just love it! Thank you again for your service and your kindness. 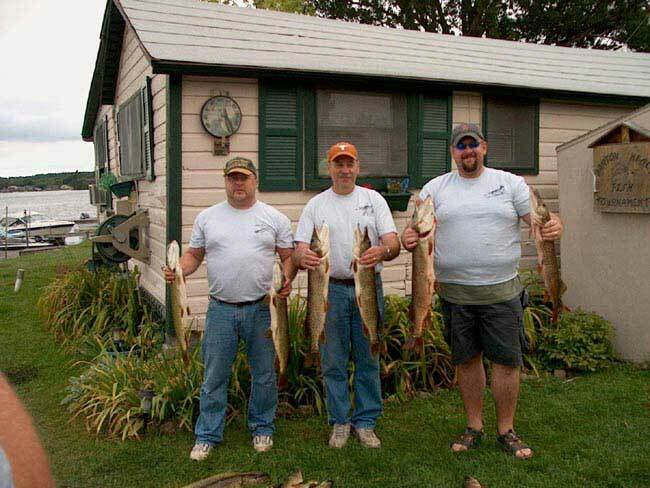 WINNING SHIRTS BRING LOTS OF FISH! I have attached some photos from our fishing trip. Feel free to use them on the Website. 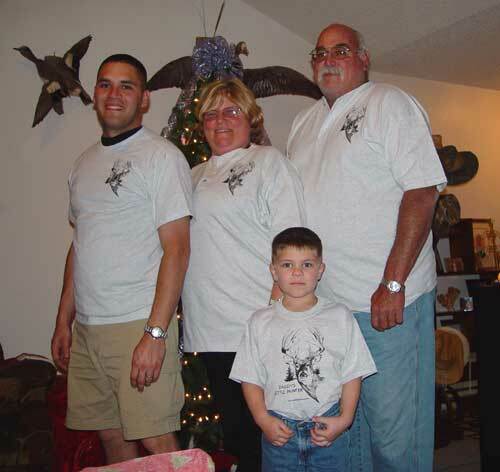 The shirts worked great. Our boat won the Fishing Derby and we caught a Walleye too! 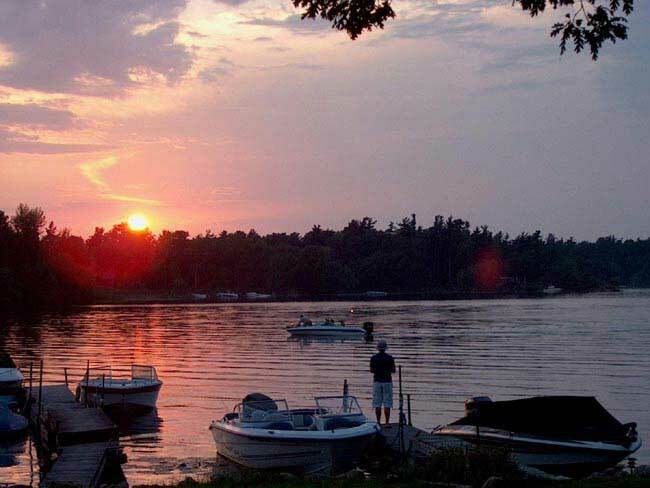 Here is another picture from the Great Sage Fishermen, this is titled "Why We Fish". 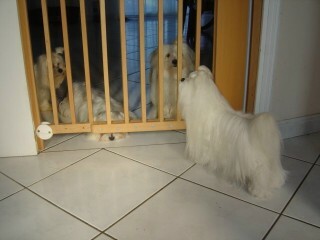 THE MALTESE GOES TO FRANCE AND FINDS 3 NEW FRIENDS! 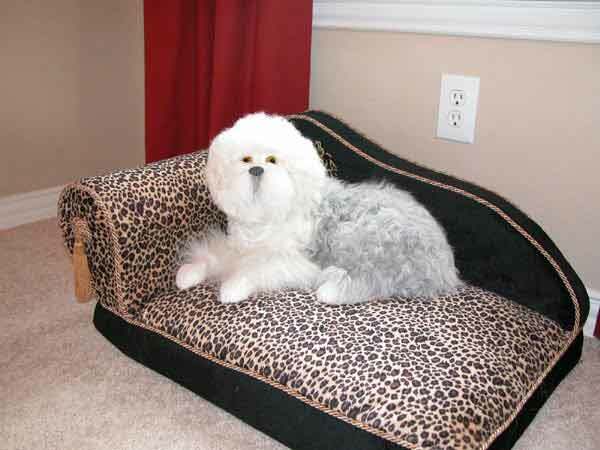 I hope this e-mail gets to you ok, but OMG and am I happy, this little dog is so much more than I expected, she is beautiful, and even my little Maltese think she is real, thank you so very much, I cannot believe it, perfect size and perfect look alike. 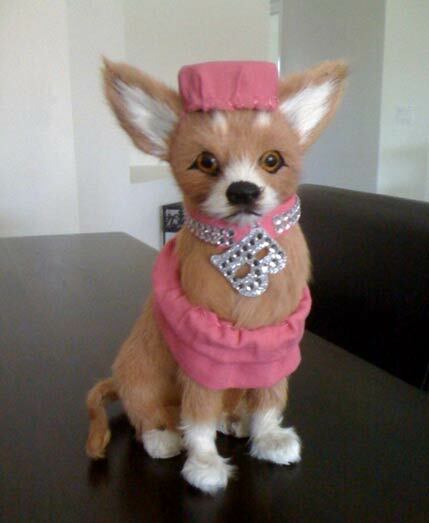 I never thought she would look this real, I am making clothes for small dogs and now she will be my perfect model as she will sit still. Thank you and I will be back, plus I am going to send photos to all my friends on the Maltese Rescue group web site, so expect more orders. Warmest regards from on very happy lady. 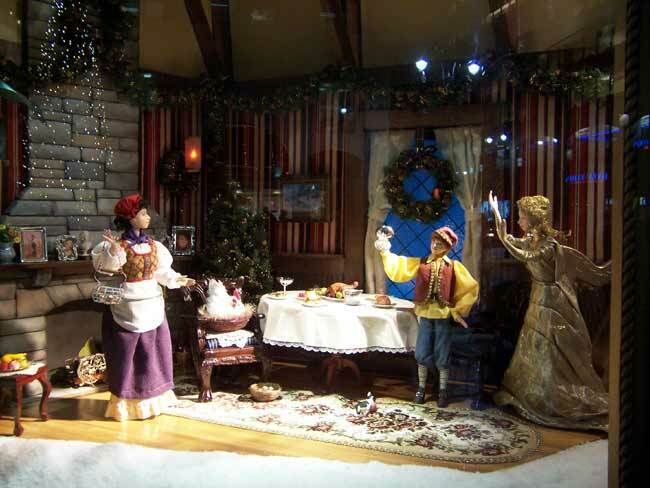 Here are a couple of pictures from the 2005 Lord & Taylor Holiday windows in New York City. there is a deer standing on the bridge on the right. Thanks so much for everything! Here is another picture from Lord & Taylor in New York City. 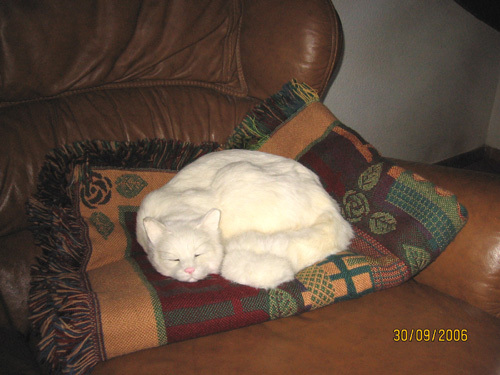 See the White Chicken on a nest in the chair? 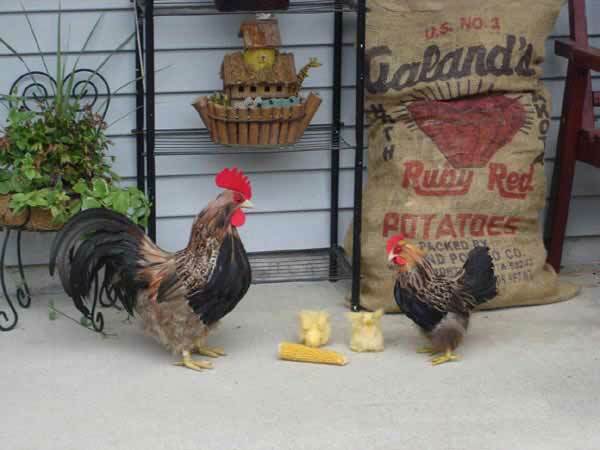 My rooster needs a family! LOL! We live on a busy road in a rural area. 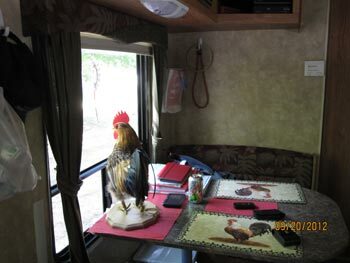 I move the rooster around all day long so he looks real! Now I can really confuse the truckers! LOL! 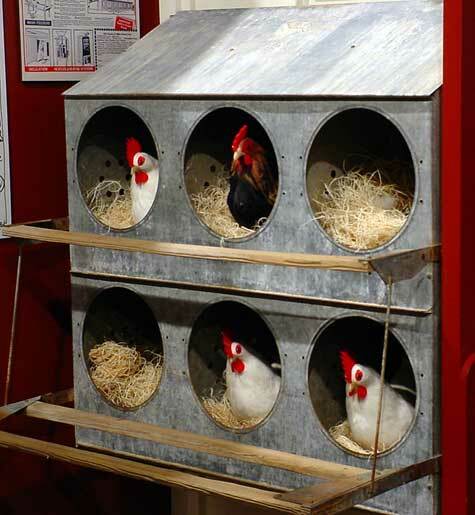 I need to go to the lumber supply store to get some chicken wire to hold the babies in! LOL! I'm going to drive all the people that pass our house crazy. I can't have real chickens here. I had them while growing up. I miss them. Roosters are my favorites! Thanks. I'm happy I found your site. I bought the rooster at a gift shop in NY State! He was a lot more expensive then your site. I promise I will email pictures back to you! It's a great cute little joke here! Well the girls made it here! Thanks. I am sending you along some pictures. 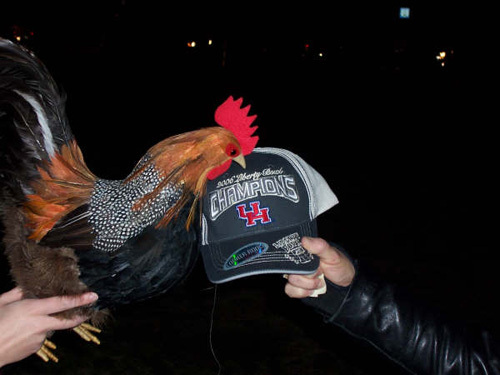 THE ROOSTER WAS A GREAT MASCOTT FOR THE LIBERTY BOWL! I finally have a minute and wanted to let you know that my daughter-in-law, Heather LOVED the rooster I bought from you for her Christmas gift! She took it to the Liberty Bowl and it was a hit! She goes to University of South Carolina in Columbia, SC. 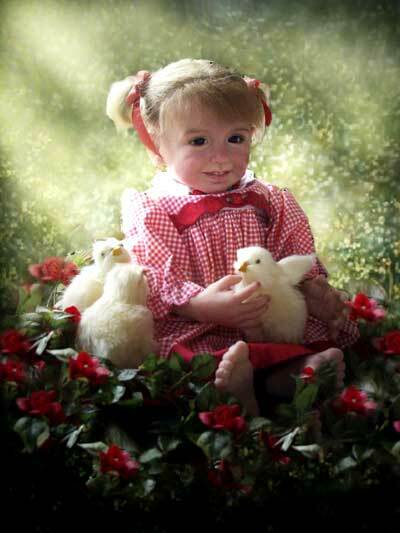 She has published some pictures on Myspace of her rooster. 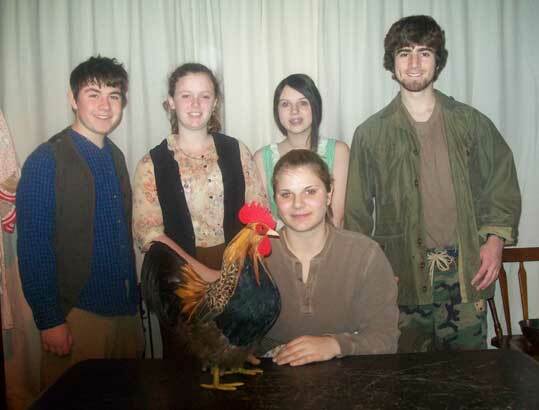 THE ROOSTER NAMED EMANON HAS A STAR ROLE IN "BALLAD HUNTER"
Here is the cast of "Ballad Hunter" with the Rooster named Emanon. Emanon is actually No Name spelled backwards. 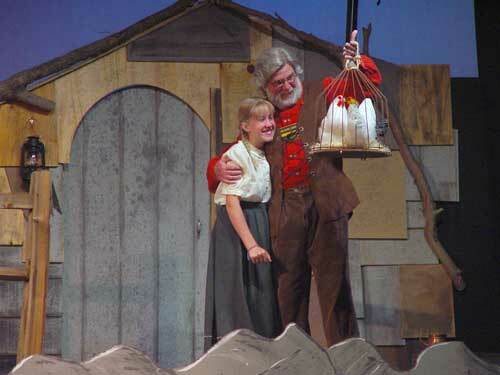 The play "Ballad Hunter" is set in 1937 in the Appalachian Mountains, where a young girls family needs food and she thinks of the neighborhood rooster who wakes them up every morning. 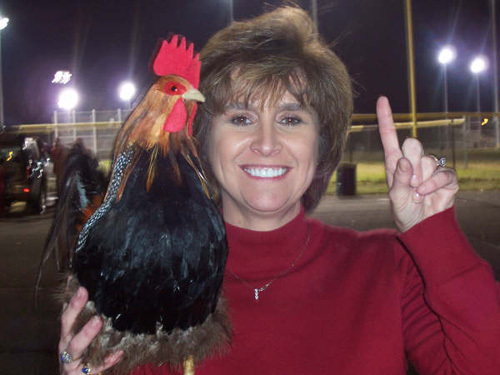 She asks her neighbor for their chicken to feed their family and the neighbor shows up one day with the dead rooster! She had no idea that the rooster had to die in order to feed them. She is upset that the rooster had to die and he didn't even have a name!!! 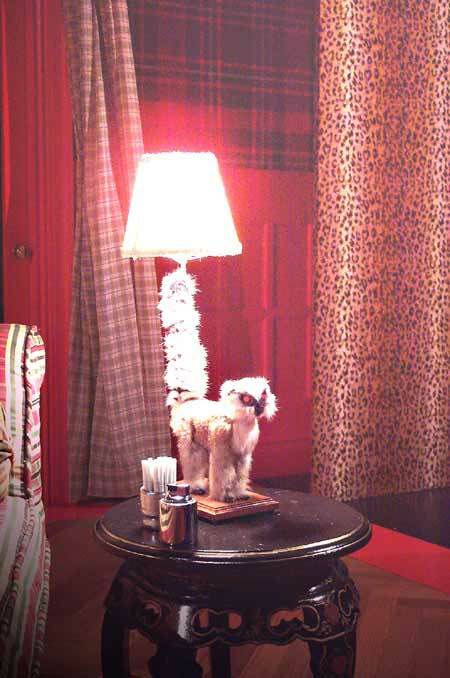 MODEL HOMES FEATURING YOUR OWN PUPPY DOG! Here is a picture of a dog that I ordered from you. The dog is very real looking. 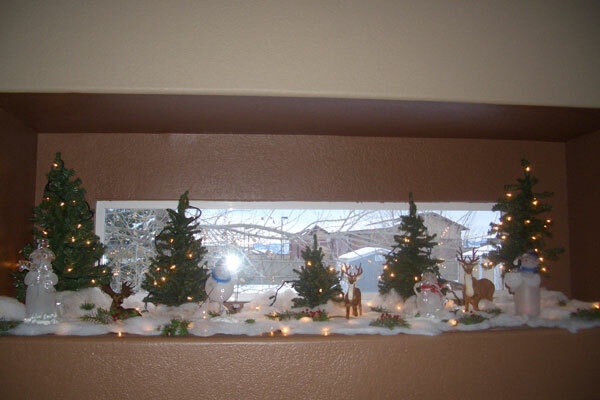 It is in one of the model homes that I did last year. I got the Bobcat, and created a "habitat" for it. We took it to school this am. I think it looks great! My daughter is very pleased, and the other kids were very impressed. Thanks for all your help. You will have glowing feedback and much appreciation. Don't Drink the Water - he has now become the theatre mascot! that I collect...please put our picture on your site...I would love people to see it. He is just so beautiful, I really like him alot. 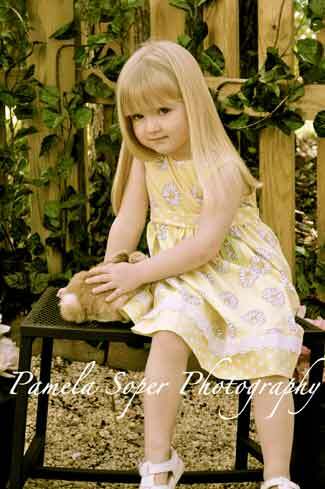 I'm glad you received the photo of our Granddaughter ok.
our back yard, I always have a big bag of peanuts to feed them. 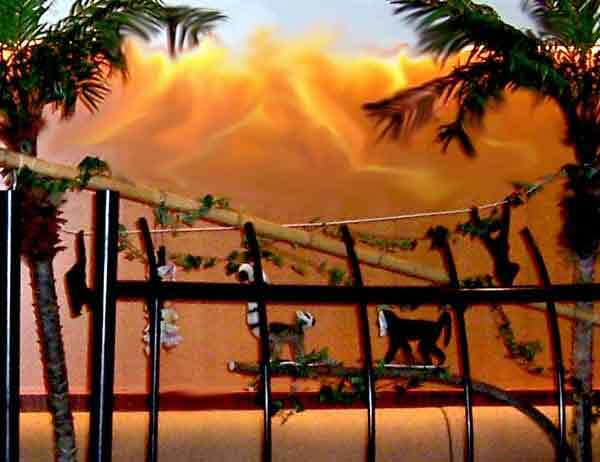 to pet the very realistic ones from Wildlife Treasures! They look and feel so real, you almost want to hand them a peanut! 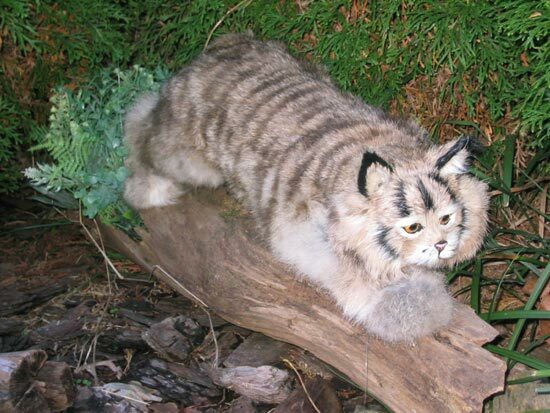 I will be calling you soon to order a cat, need your help in picking out the right one. 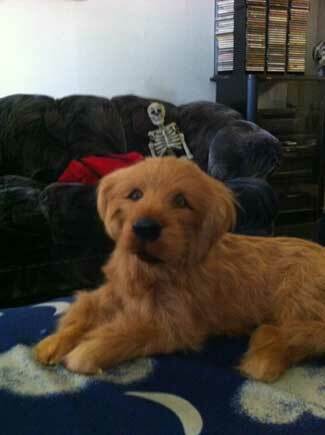 I finally have some pictures of my mini Golden. My husband is a skier and I have two Goldens that are show dogs. 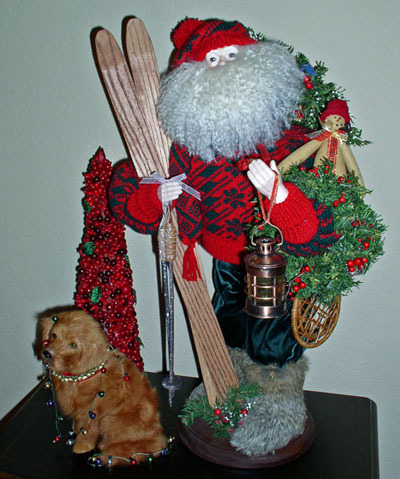 We found this beautiful Skiing Santa by Chelsea for out Christmas collection. The only thing he needed was a Golden Retriever. Now we are complete! I made a mini jingle bell collar for him, just like the ones my girls wear during the holidays, and I threw some mini lights around him. He looks like a very normal scenario at our house! We love him and thanks again! "The Mystery of Irma Vep" by Charles Ludlam. It's a hilarious show about vampires, werewolves, mummies, murdered wives, and a haunted mansion.....2 male actors each play about 5 roles each. 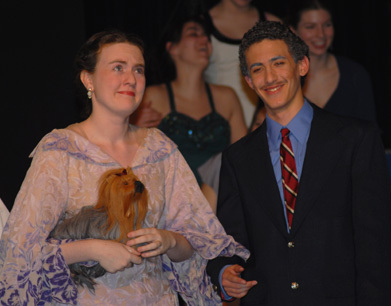 It's a show filled with quick-change costumes and full-on drag. scary moments when lightning cracks briefly plunging the stage into darkness. The audiences shriek with delight. Thanks for all your help. We'll be sure to call again if anything comes up in the future. ANOTHER PICTURE FROM "THE MYSTERY OF IRMA VEP". 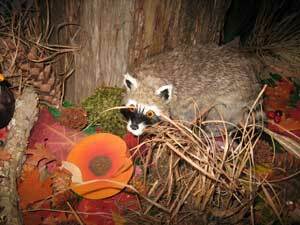 THE SCARY LEMUR LAMP IS IN THE BOTTOM RIGHT CORNER, CHECK OUT THE RED EYES! 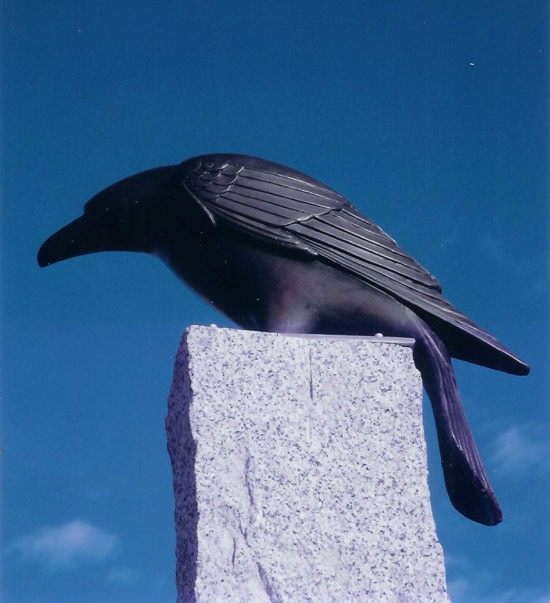 THE BLACK CROW WAS A MODEL FOR THIS BEAUTIFUL SCULPTURE! THE ARTIST, ERIC IS HARD AT WORK! 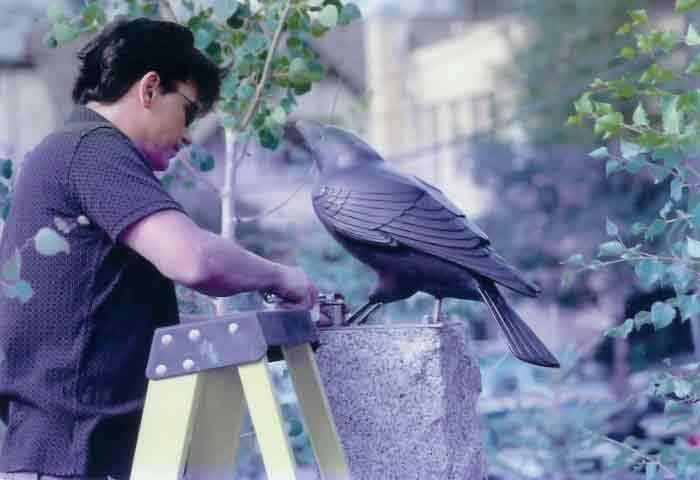 Hi, This is my son fixing one bird to the granite. He is doing another large installation for the Tillamook Park in Oregon....large gate on a bridge and then outside the Nature house a large piece with carvings of animals. I will probably be in touch for more figures he can work from. It is not easy to sculpt some of the wild animals either from photos or memory...he needs the 3-D form to work from. He is finishing off a bird with the wings spread for another commission right now. When it is cast I will send you a picture. at the same university. I hope this information helps and let me know if you have any other questions. 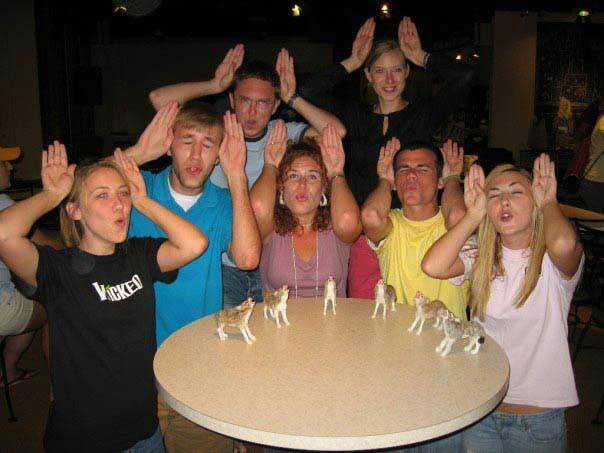 CAN YOU SEE THE TAN BUNNY RABBIT AMONG THE MONKEYS? I purchased my furry lab because I needed it to complete my collection. Rusty & Sandy, who are the loves of our lives. 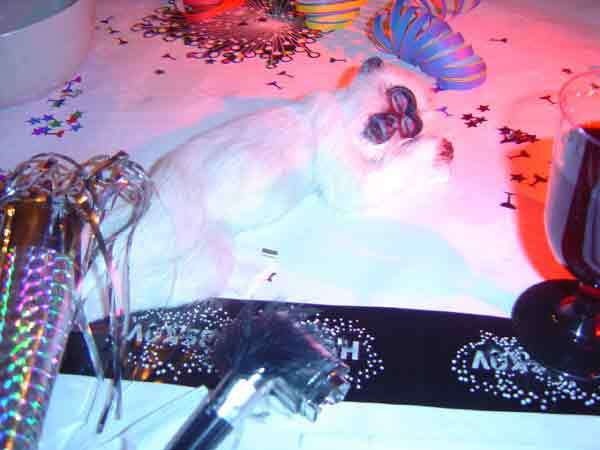 the monkey is done partying for now! CARLSEN IN DENMARK WITH HIS FAVORITE MONKEY! 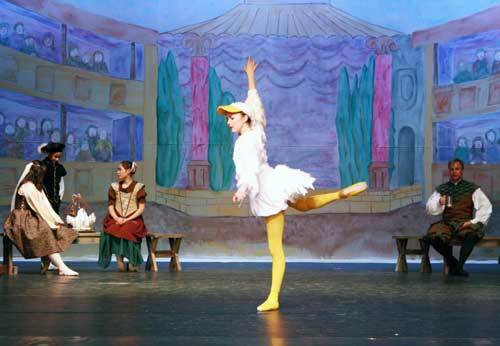 "OTTO" THE WHITE DUCK STARS IN THE PLAY "PIPPIN"
Lehigh Valley Charter High School for the Performing Arts in Bethlehem, PA. 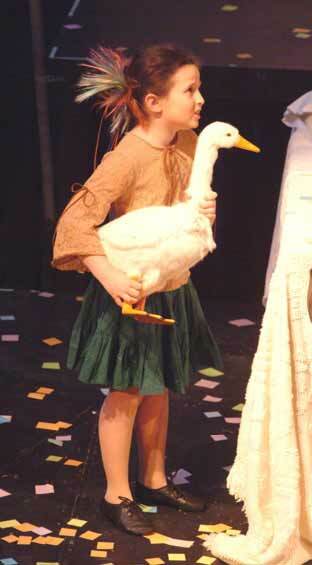 I was the director of this musical... and the little girl who held the duck, her name is Meredith. a big hit! Also, if you could please, give credit to Mr. Chuck Hudak for taking the pictures. such a realistic stunt duck! Hope we can do something again in the future. 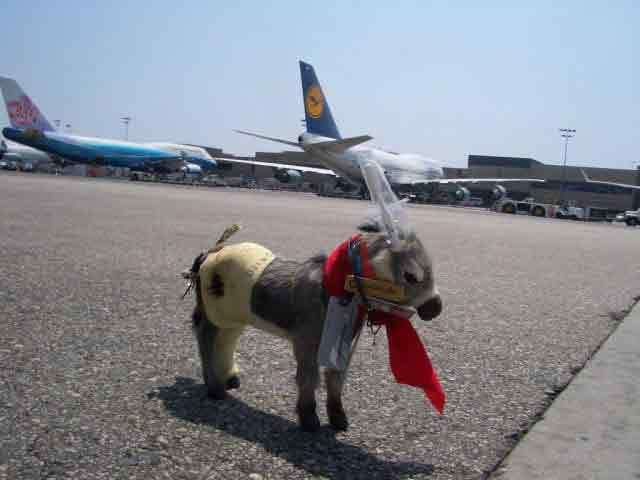 INTRODUCING PEDRITO THE WILD & CRAZY DONKEY!! Rocky Mountains to the Chu Chi tunnels of the Viet Cong. Where is Pedrito going next? HAS MET MANY BEAUTIFUL LADIES! 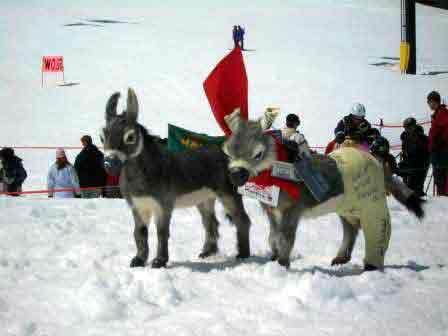 HERE ARE PEDRITO & PEPITO IN THE SNOW! been spotted in Eastern Afghanistan. Do you have a picture that you would like to share with us?? We would love to see it!! Please include a sentence or paragraph of information. 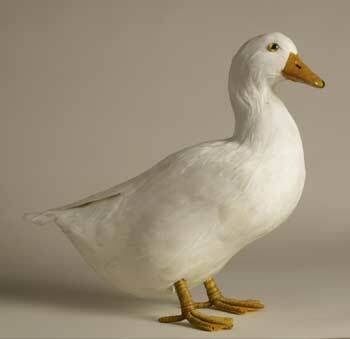 Realistic & lifelike animal figurines made with goat, rabbit fur and chicken feathers! 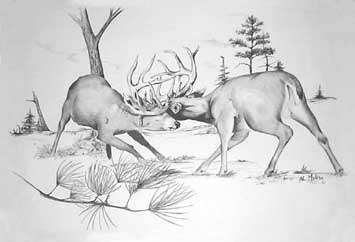 Original Wildlife Art Screen Printed Clothing.